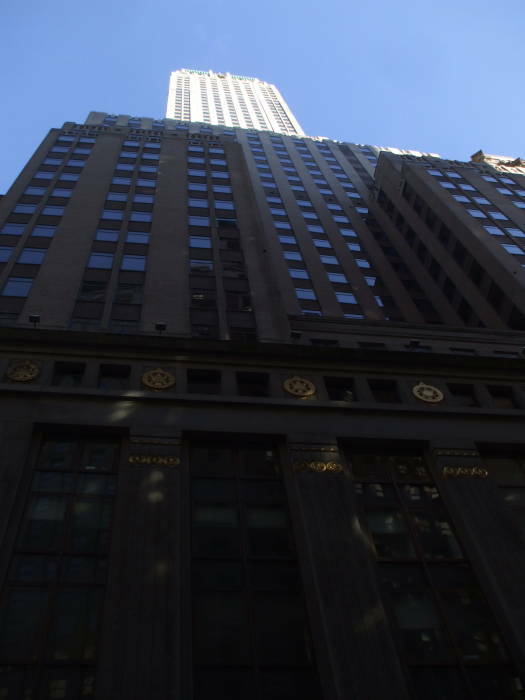 New York has been a crucial world-wide telecommunications hub at least since the 1920s. Telegraph cables and pneumatic tubes ran all over and under the southern end of Manhattan. Buildings that once were telegraph company headquarters are now home to major Internet facilities. And now there is very little distinction between voice and data communications. 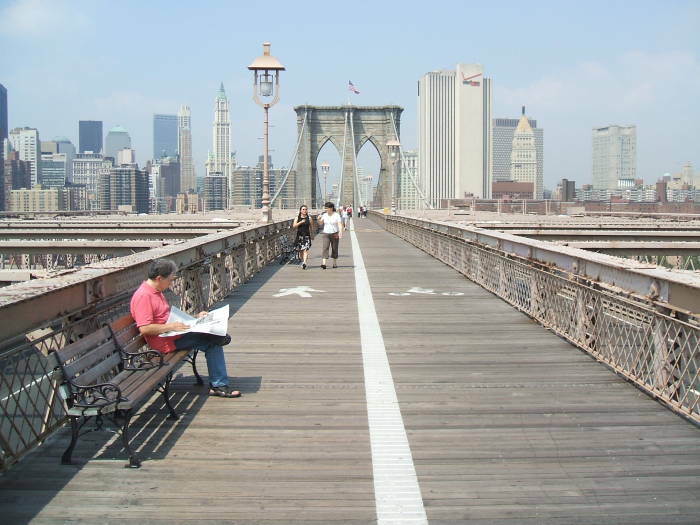 The picture at the top of this page is a view across the East River from the Manhattan Bridge, looking toward lower Manhattan. Many movies set in New York show a similar view. And so every one of those shows the Verizon building near the Manhattan end of the Brooklyn Bridge. 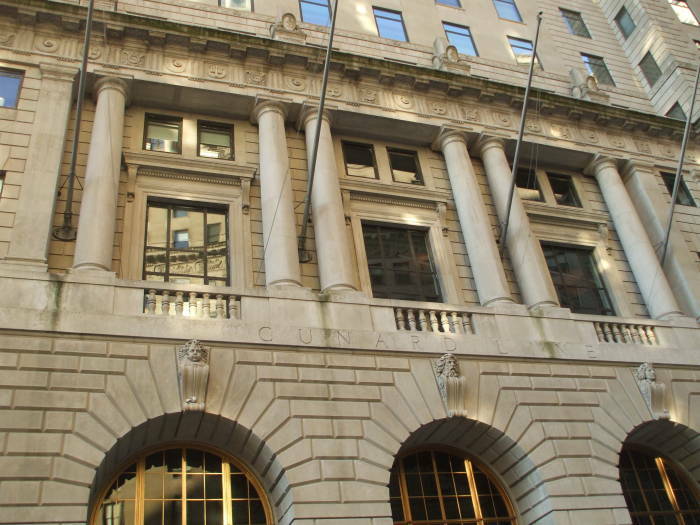 Is it a bad idea to locate data centers in Lower Manhattan? No, it's a good one, as long as you are careful about the design of your data center and its emergency processes. Let's say you put a data center well inland in New Jersey or even farther into the hinterlands. The first hop for all that Manhattan based traffic is going to be the same facility at 60 Hudson or 111 Eighth Avenue that you were trying to avoid relying on in the first place. Besides, Tuckerton NJ and the surrounding area include the landing sites for a number of cables to Europe, the Caribbean, and South America. 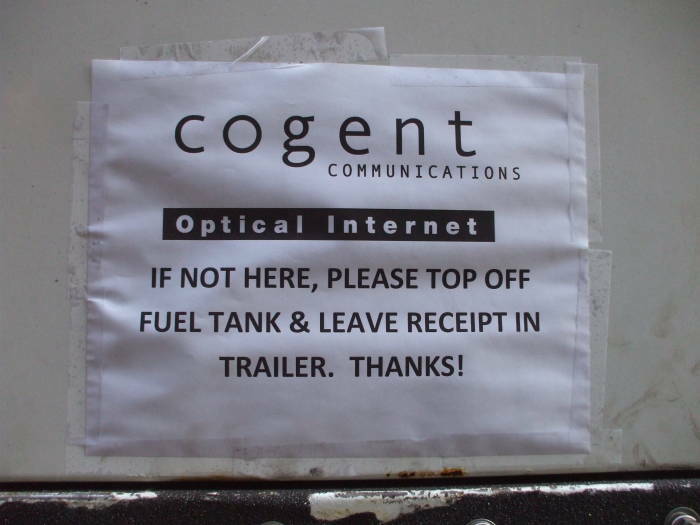 If you are really concerned about latency, remember that the speed of light is a hard limit. No faster than 300 million meters per second! So, 300 meters closer means one microsecond sooner. High-frequency trading organizations care about being a few blocks closer, especially when they get into ultra-low latency activity. Speaking of hops, this page shows some places you usually just see as router hops in traceroute output, but here you can see what some of the ones in Manhattan look like. No. Calm down. These data centers are all heavily marketed. Several are such well known landmarks that they have their own Wikipedia pages describing their current function. In New York they don't panic if you photograph a bridge or a post office, unlike in Washington D.C. or a few countries ruled by paranoid thugs. Settle down and enjoy the pictures. 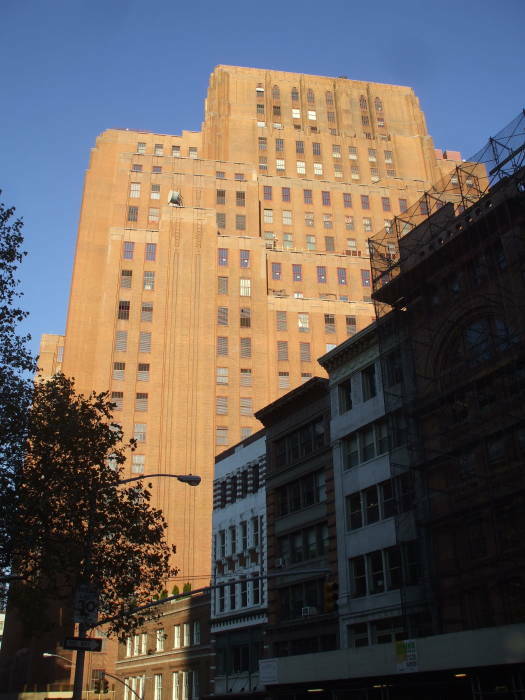 60 Hudson Street was built in 1928 through 1930 as the headquarters of the Western Union Company. The company maintained its headquarters there until 1973, when they moved their headquarters to New Jersey. 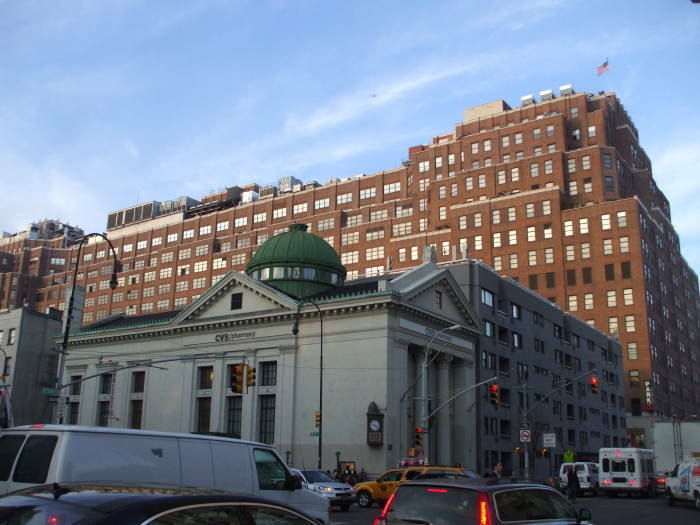 As seen here, we have just exited the Chambers Street 1/2/3 subway station and turned to look north to the building. Western Union was founded in 1855 as the consolidation of two competing telegraph companies founded in the preceding four years. It bought up smaller companies, so that by 1860 its network extended from the East Coast west to the Mississippi River, and from the Great Lakes south to the Ohio River. It established the first transcontinental telegraph link in 1861, and from 1865 to 1867 it attempted a project to link the U.S., by way of Alaska and Siberia, to Moscow and beyond to Europe. Western Union was the source of the first stock ticker in 1866 and the first standardized time service in 1870. This was followed by their money transfer service in 1871. By 1900, Western Union operated one million miles of telegraph lines and two undersea international telegraph cables. Then Western Union offered the first consumer credit card in 1914, intercity fax transmissions in 1935, and commercial intercity microwave communication links in 1943. In 1964, the national network of copper telegraph lines was replaced with microwave links. In 1974 it became the first U.S. telecommunications company to operate its own fleet of geosynchronous communications satellites, known as Westar. These satellites carried Western Union telegrams and mailgrams and signals for its Telex and TWX radioteletype services. The transponder links were also leased to other companies. Western Union had been involved in projects that grew into the Internet. Plan 55-A was a fully automatic switching system with automated routing, used as the last paper tape message switching system from 1948 through 1976. Western Union was a prime contractor for AUTODIN, a U.S. Department of Defense telecommunications system developed in the 1960s. AUTODIN used mechanical punched card readers to send and receive data over leased lines. At its peak, it handled over twenty million messages per month. But Western Union failed to design a useful AUTODIN II, at which point BBN developed a packet-switched network that became ARPANET. AUTODIN lingered until 2000. Costs rose, profits fell, and Western Union started getting out of the telecommunications business. At the end of February, 2006, Western Union discontinued all telegram and commercial messaging services. Telegram traffic had fallen to just 20,000 messages per month. Today, Western Union is known mostly for check-cashing and money transfer, two financial services for which extortionary fees are charged. And, Western Union services are popular with scammers and on-line criminals. See the Wired article about Râmnicu Vâlcea, a Romanian town known to western law enforcement as "Hackerville", with just 120,000 residents and at least two dozen Western Union locations within one four-block area downtown. 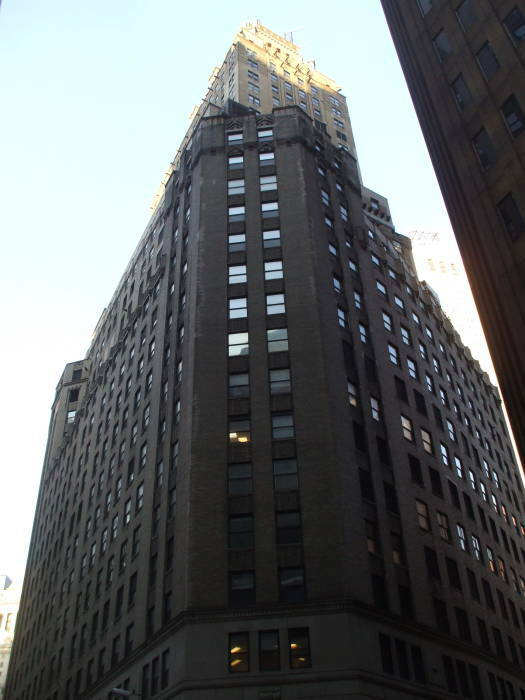 The Western Union building at 60 Hudson Street contained telegraph equipment, of course, along with some 70 million feet of cable. It also housed offices, an auditorium, a cafeteria, a gymnasium, and even classrooms so the telegraph messenger boys could attend school classes between their message runs. Now the building is once again a major telecommunications hub. It is now a carrier hotel where over 100 telecommunication carriers have a presence and over 300 domestic and international networks are housed. A large number of individual companies' fiber optic lines run into the building. It includes a 47,500 square foot meet-me room where the many companies can interchange Internet traffic. See zColo's page for more details. They offer carrier-neutral data center space in suites, private cages, and lockable cabinets on floors throughout the building. There is in-suite connectivity to 48 different carriers. AT&T, BCE Nexxia Corp, British Telecom, Cablevision Lightpath, Cavalier Telephone, CenturyLink, CENX, Cogent Communications, Deutsche Telecom, Elantic, Energis, FiberNet Telecom, Global Crossing, Group Telecom, Hibernia Media LLC, Korea Telecom, Level 3, Lightower, MetCom, NOS Communications, Onvoy Inc, Pacnet, PCCW Global, Primus Qwest, RCN NY Com, Reliance Globalcom, Reliance Globalcom, SAVVIS, Shaw, Sidera Networks, SingleCNXT, Stratos Mobile, Telx, TW Telecom, Tricom, Verizon, Verizon Business, XO Communications, and Zayo. 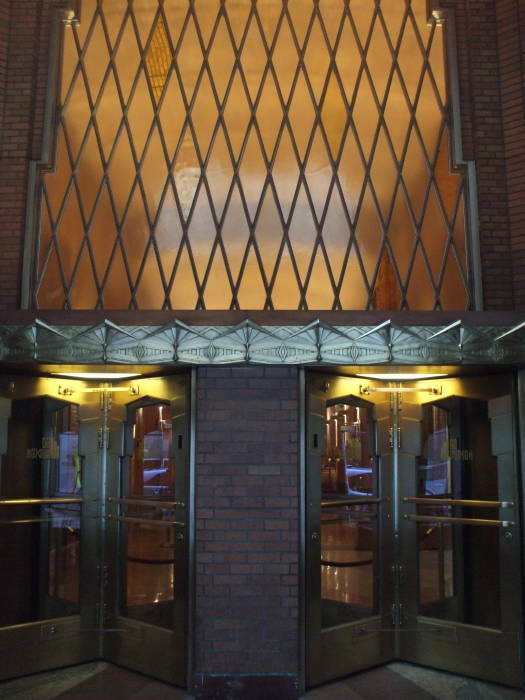 The exterior detailing is Art Deco, including the ornate brickwork and the brass and glass entryways. For electrical power, they have dual incoming utility feeds from separate substations off of two isolated grids. Those electrical feeds lead to 1600-ampere AC switch gear. There are N+1 parallel redundant 225 KVA UPS modules. Backup generators can produce 3 MW of electrical power. See the Telx facility data sheet for more. 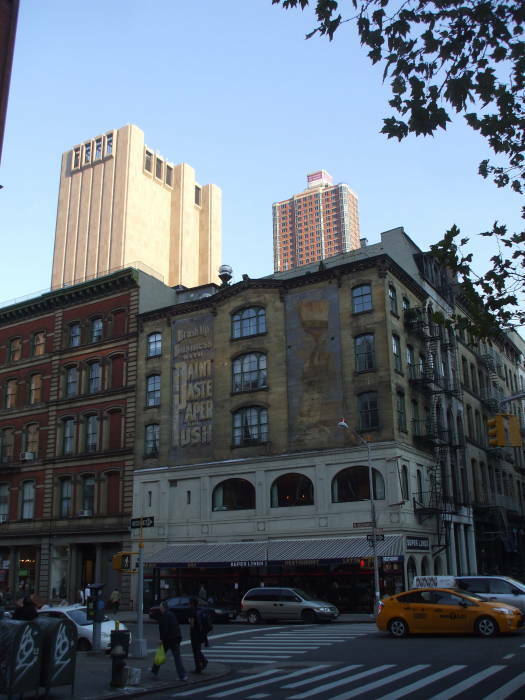 The building towers over the more typical buildings of the Tribeca district, which tend to be just five to eight stories tall. "Tribeca" is one of those common New York abbreviated place names, really TriBeCa, meaning the Triangle Below Canal Street. 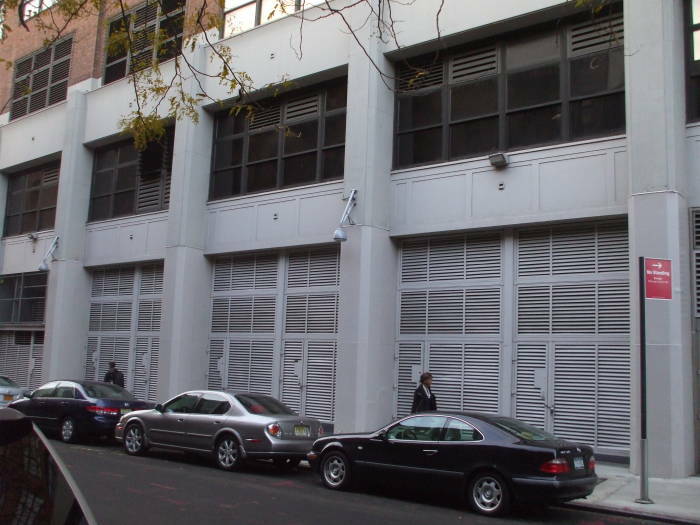 In 2006, the New York City Department of Buildings approved the storage of nearly 2,000 gallons or 7,500 liters of diesel fuel on six floors of the building, adding to about 80,000 gallons or 300,000 liters already stored in the building. I would assume that most of it is stored down below ground level. There was opposition at the time, over concern that all that fuel posed a fire hazard that could result in the catastrophic failure of the structure. This is what happened to 7 World Trade Center during that afternoon after the September 2011 terrorist attacks. The opposition said that the storage would violate an existing law prohibiting above-ground diesel storage within 1,000 feet of the nearest wall of a building occupied by a school or hospital, or within 1,000 feet of an entrance or exit from a tunnel used by motor vehicles, subway or railroad cars. The city said that the law was a part of the fire code applying only to wholesale bulk oil storage where petroleum products are offered for sale. As we will see below in the section about Hurricane Sandy in 2012, some times it is very useful to have some of your diesel fuel upstairs. 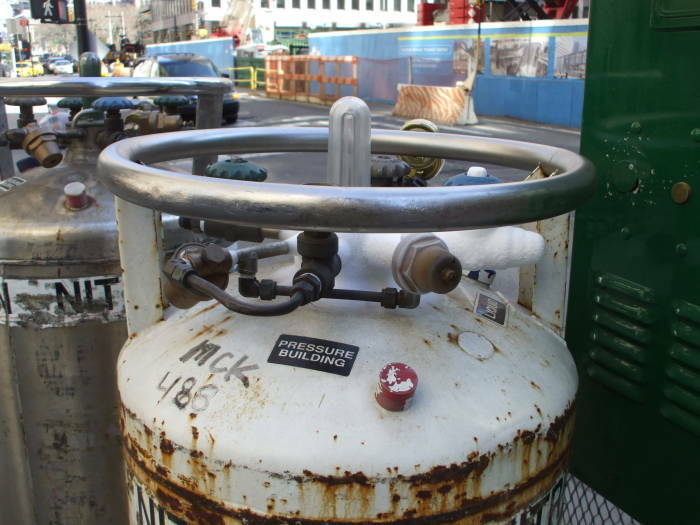 The Department of Buildings negotiated a variance to allow fuel storage on six floors in excess of code limits in return for installing fire safety equipment beyond what is required by law. 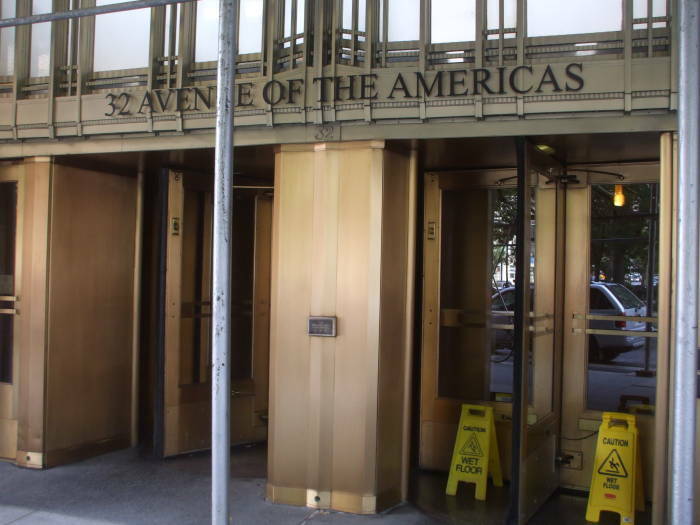 Just a few blocks north of 60 Hudson Street we come to 32 Avenue of the Americas. It gets referred to as The Hub for its large meet-me room, and CoreSite, for one of its major tenants. Amazon Web Services has a major presence here. This is one of the few facilities that Amazon openly describes as an AWS site. The floors of the building have 14 to 19 foot ceilings. CoreSite advertises 50,000 square feet of data center here, with up to 25 kW of electrical power per cabinet backed up by UPS and generators. 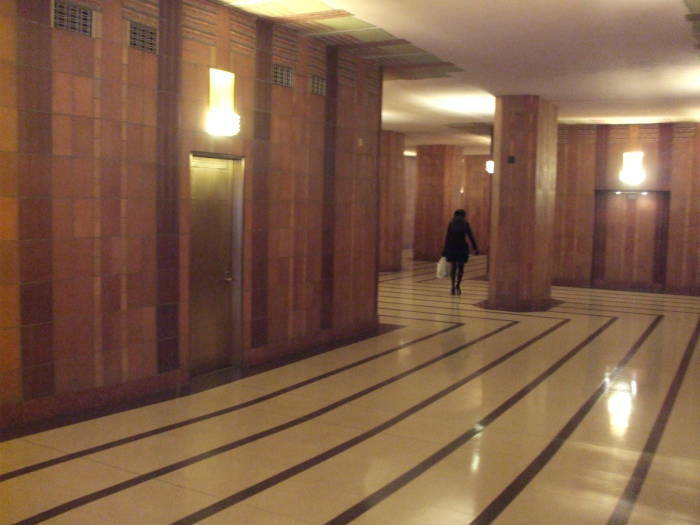 32 Avenue of the Americas was completed in 1932 and became the AT&T Long Lines Headquarters. It housed switching equipment and control systems for AT&T's North American and Transatlantic networks. The AT&T Long Lines network was originally based on heavy-duty open-wire copper lines. It reached west from New York to Denver by 1911. By 1914, vacuum tube amplifiers allowed the network to support coast to coast connections. Coaxial cable began to be used in the 1930s, with several voice signals multiplexed together as single sideband channels. This evolved through a series of designs combining more and more voice channels, with the coaxial cable systems in the 1960s hardened against nuclear war with all terminal and repeater equipment in hardened underground vaults. Meanwhile, after World War II, klystrons developed for radar and other microwave applications were more capable and economical. Coaxial cables with 3,600 or 10,800 voice circuits connected major U.S. cities, and there was a digital microwave waveguide system joining New York and Philadelphia, but most traffic moved over point to point microwave links at C band, 4-8 GHz. Television began to be carried on the Long Lines network. 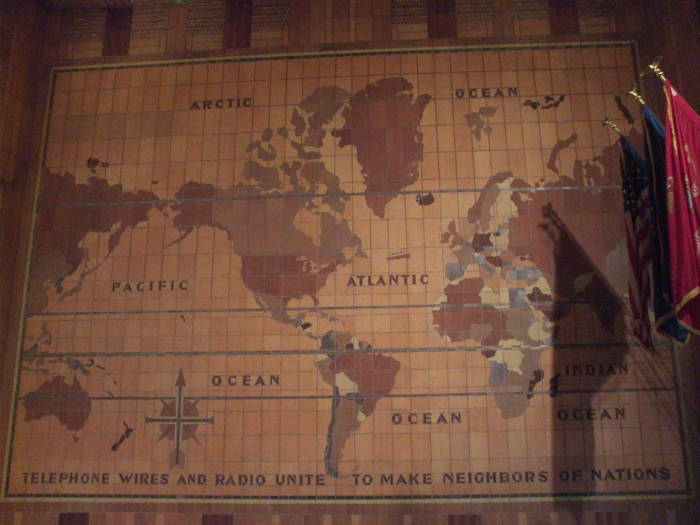 Coast to coast television distribution was first used to relay Harry Truman's address at the San Francisco Peace Conference in September, 1951. Proved to work by Presidential demonstration, it was then available for less significant applications. ABC's Monday Night Football could be broadcast live nationally, and regional football game distribution was possible before the development of portable satellite uplinks. By the 1970s, the AT&T Long Lines network carried 70% of intercity telephone calls and 95% of long distance television distribution. Starting in the 1980s, fiber optic and satellite links began replacing the point to point microwave links. As you see here, some of the windows were replaced with louvers when the building was extensively remodeled in 2001-2002 to install new mechanical and communications systems. They also added two 120-foot communications masts to the top. These provide line of sight connectivity to thousands of buildings throughout the five boroughs of New York City and across the Hudson into New Jersey. Let's look inside! 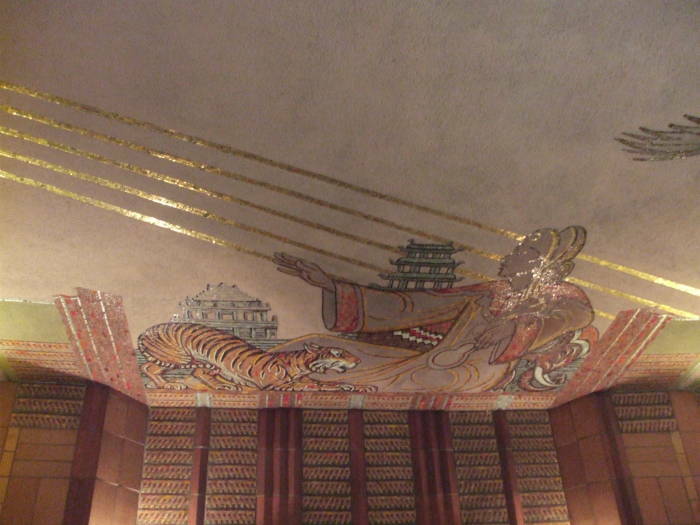 It was designed at a time when allegorical representations of exotic foreign lands were all the rage. Just a few blocks away to the southeast is 33 Thomas Street, definitely not in the style of the 1920s and 1930s. 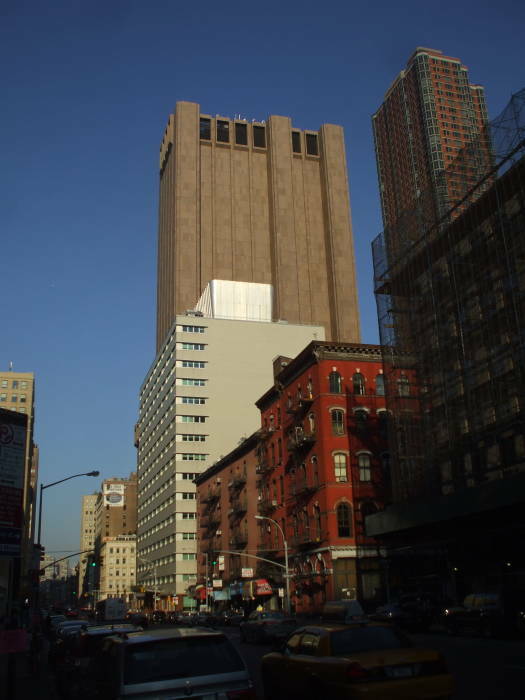 This 550 foot slab-faced building is the AT&T Long Lines Building. Architects really do refer to this design as the Brutalist style. It was completed in 1974, designed and built to house telephone switching equipment and not humans. There are no windows in the flat facades, which are made from precast concrete slabs faced with pink flame-treated textured granite panels. The average floor height is 19 feet or 5.8 meters, with the floors designed to hold live loads of 200-300 pounds per square foot or 10-15 kPa. High floors, so there are only 29 of them in the 550 feet. 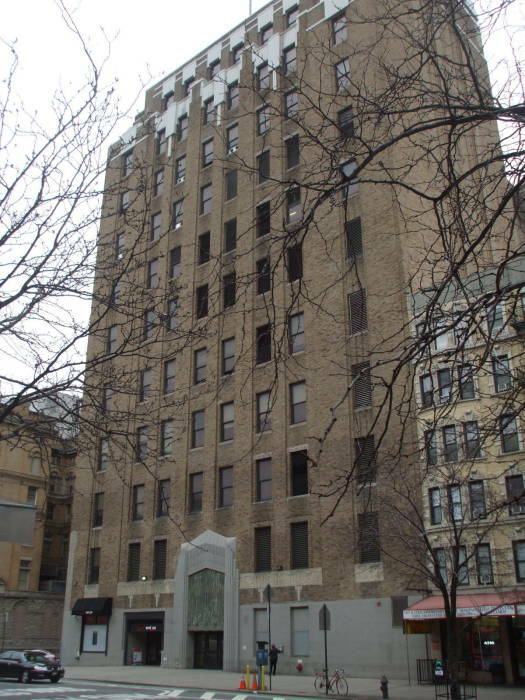 The building functions as a telephone exchange containing three major 4ESS switches handling interexchange telephony, two of them owned by AT&T and the third by Verizon, plus several other switches used for competitive local exchange carrier services. It also houses data centers. The 4ESS was the first digital electronic toll switch introduced by Western Electric. Its design began around 1970, and it was introduced in 1976. The last one was installed in Atlanta in 1999. Almost 150 remain in service, including the three here. All have been upgraded from the 1A to the 1B Processor, and have 4E APS or Attached Processor System for long-term disk storage of the programs and office data. All 4E APS units were upgraded to the 3B21D Computer around 1995. The 4E APS connects to the Common Network Interface Ring to provide Common Channel Signaling. Peripheral units connect the switch to the transport network. Bell Long Lines became AT&T Communications when the Bell System split up in 1984. 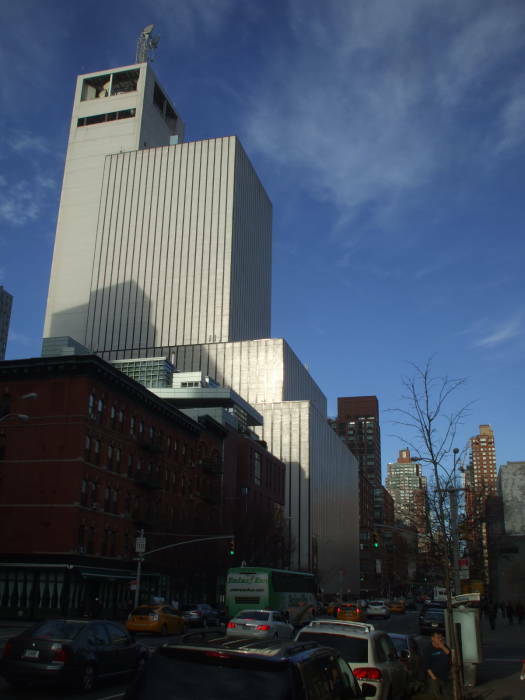 AT&T gradually moved switches and other equipment from the former Bell Telephone headquarters at 32 Avenue of the Americas, completing the transition in 1999. This building was designed to be entirely self-sufficient and resistant to nuclear fallout for up to two weeks after a nearby nuclear blast. Physical security is very tight. It certainly is not in the style of the rest of Tribeca. The three large rectangular protrusions seen here running from ground level to the top, plus the three on the opposite side, house elevators, stairs and ductwork. The rectangular openings at the top and about a third of the way up are for ventilation. Despite all the design and planning, it isn't perfect. It completely failed on September 17, 1991. It was a combination of management planning failure, equipment failure, and human error. Because of the self-sufficiency plan, AT&T had a load-shedding agreement with Consolidated Edison, the electrical power utility, where the facility would switch from utility power to on-site generators on request from ConEd. This switchover was a routine operation which usually worked with no problem. But on this occasion, scheduled training got in the way of the standard procedure to check on all the equipment power supplies, known as the DC plants. One DC plant had not successfully switched to generator power, and it went on battery backup. That was not detected until it was too late to maintain uninterrupted power. The result was that over 5 million calls failed. The Federal Aviation Administration's private lines were disconnected, disrupting air traffic control to 398 airports serving most of the northeastern U.S. 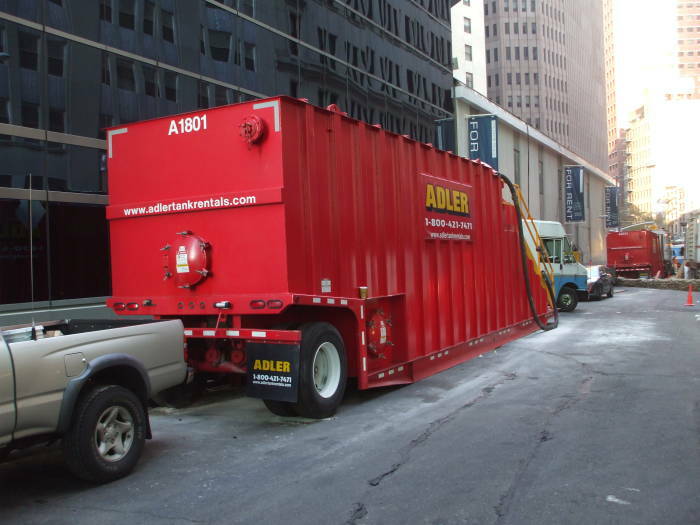 When you switch to your on-site generators, make sure that you really have switched to your generators. In November 2016 The Intercept announced that the Ed Snowdon papers revealed, I would think to no one's surprise, that 33 Thomas Street has been an NSA tapping point all along. The New York Times also reported on the story. We're starting across the Manhattan Bridge to Brooklyn on the bridge's south side pedestrian walkway. That's Lower Manhattan in front of us, beyond the Brooklyn Bridge. 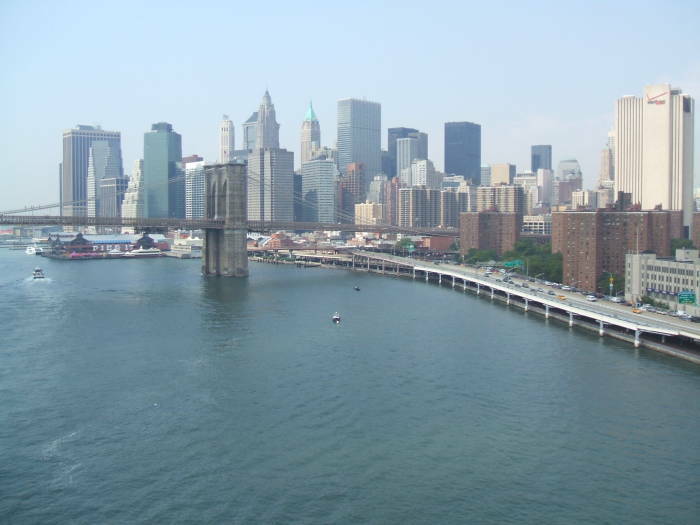 The FDR Drive is the expressway running along the East River shore. See that large white building at the far right. 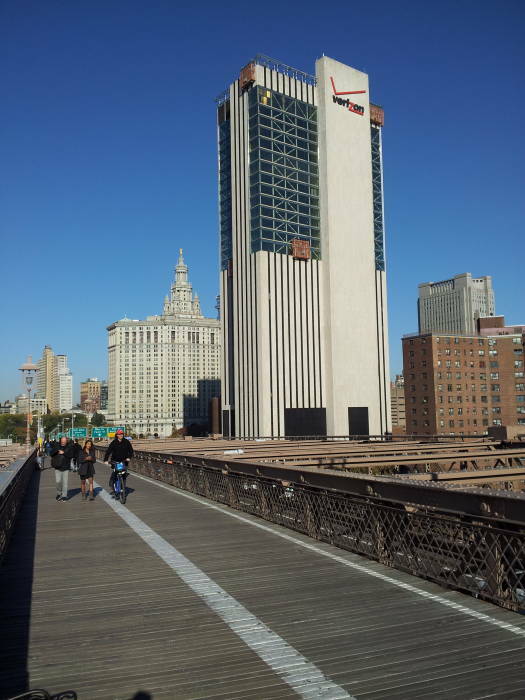 That's 375 Pearl Street, also known as the Verizon Building and One Brooklyn Bridge Plaza. 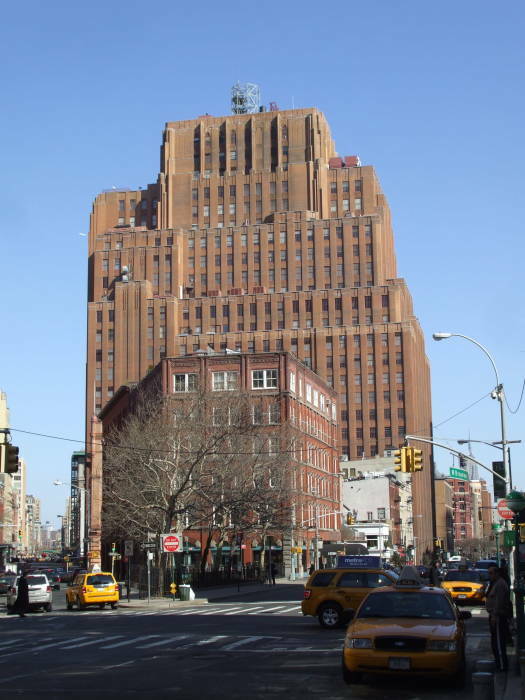 It was completed in 1975 for the New York Telephone Company, intended as an enormous switching system. It appears as if it has no windows, but there is some glass in those three-foot slits running the height of the structure. Now we're returning from Brooklyn on the Brooklyn Bridge and approaching its mid point, with the Verizon sign on 375 Pearl visible ahead of us. 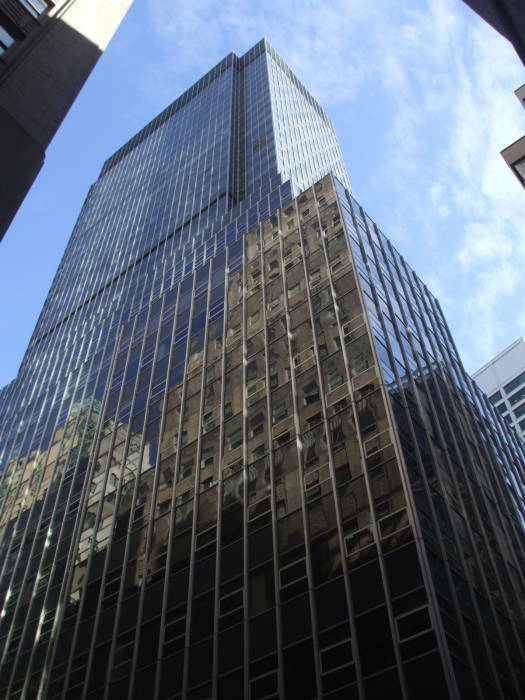 Verizon owned 375 Pearl in 2007, when they sold the building to Taconic Partners. Verizon then leased back floors 8, 9 and 10, where they operate a DMS-100 switch. 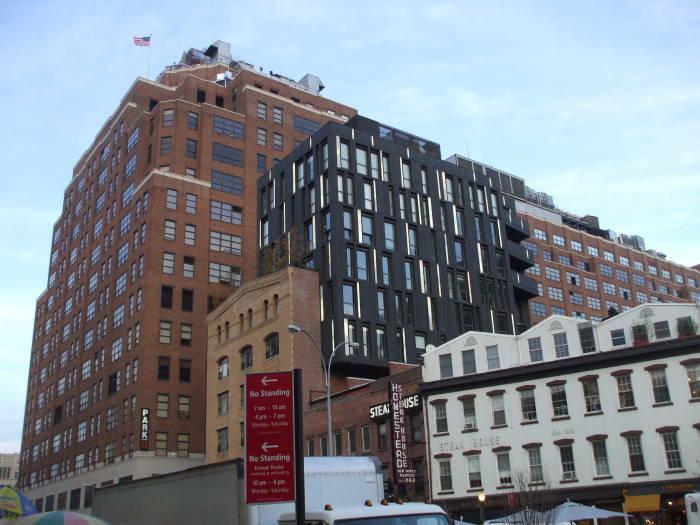 Taconic announced that they would replace the largely featureless facade as they redeveloped the building for condominiums. It would have been spectacular housing, with 17-foot ceilings and views over the East River and Lower Manhattan. 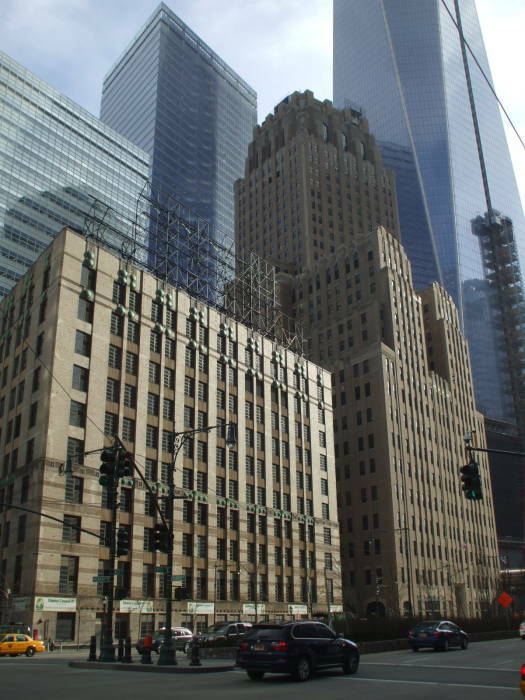 Taconic had bought the building in 2007 for well below the current going price for Manhattan property, but in 2011 it was purchased by Sabey Data Center Properties from M&T bank in lieu of foreclosure, for just two-thirds what Taconic had paid. 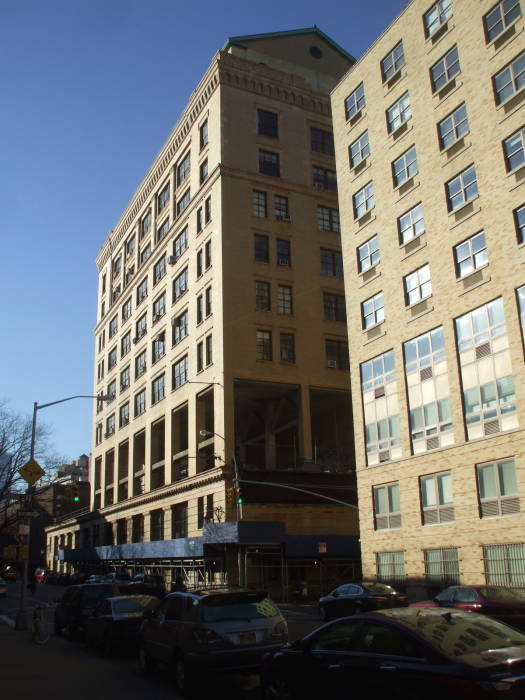 Sabey's president, John Sabey, said "As the few major existing data centers and carrier hotels in Manhattan are nearing capacity from space, power, and cooling perspectives, we view 375 Pearl as an asset uniquely positioned to offer a world class computing environment for those users with on-island data center needs. The building has all the bones — an abundance of power, a purpose-built structure, and tremendous prospects from a connectivity standpoint to be just that." By late 2016 the conversion was underway. 375 Pearl Street being converted to condominiums in November 2016. 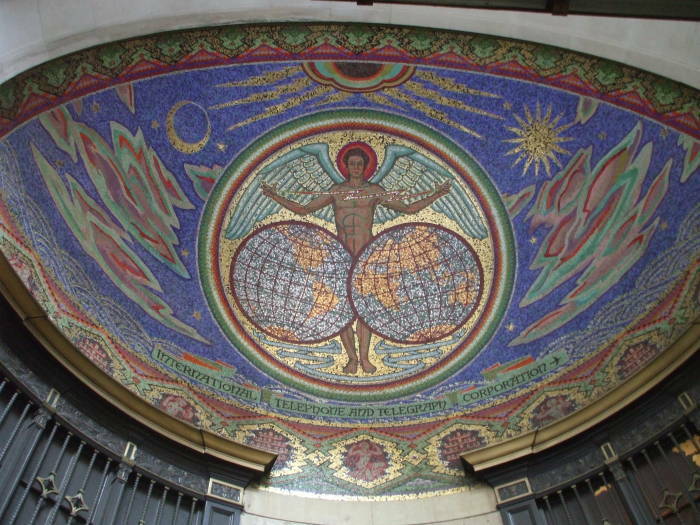 75 Broad Street was the former headquarters of International Telephone and Telegraph, which was founded in 1920. ITT was founded by two brothers who in 1914 had acquired the Puerto Rico Telephone Company, the Cuban-American Telephone and Telegraph Company, and a half interest in the Cuban Telephone Company. Then, in the early to mid 1920s they consolidated the Spanish telecom market into what is now Telefónica and purchased a number of European telephone companies. They also acquired a number of U.S. cable and telegraph companies. 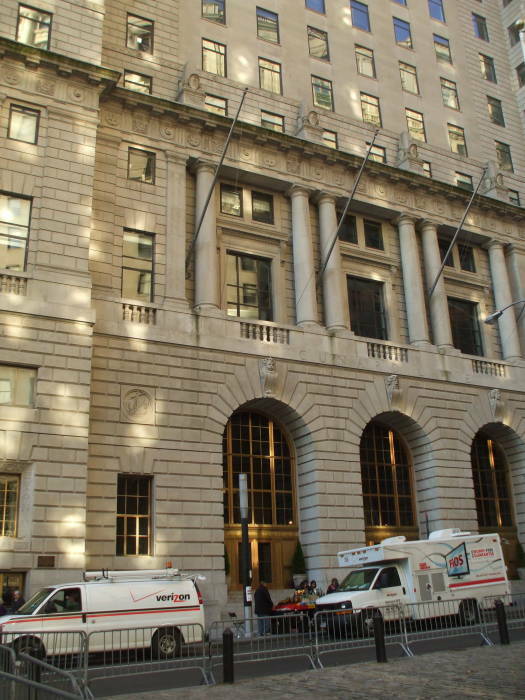 The facility was built in 1929, just one block south of the New York Stock Exchange. 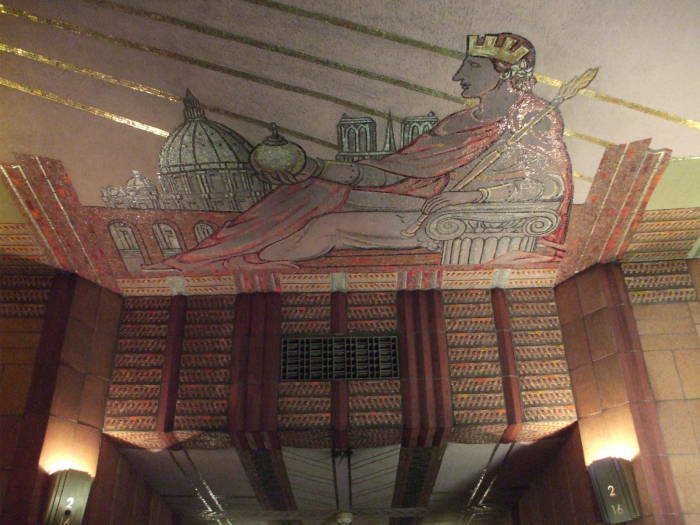 The mosaic over the main entry shows that this isn't some new glass box of a building. ITT made some unpleasant alliances along the way. After Hitler took power in 1933, one of the first U.S. businessmen he received was ITT CEO Sosthenes Behn and his German representative, Henry Mann. The ITT subsidiary the Lorenz Company soon came to own 25% of Focke-Wulf, the German manufacturer of some of the most successful Luftwaffe aircraft. In the 1960s, ITT won $27 million in compensation for its share of damage inflicted on Focke-Wulf plants by Allied bombing. Then there was ITT's involvement in coups in Brazil in 1964 and in Chile in 1973. 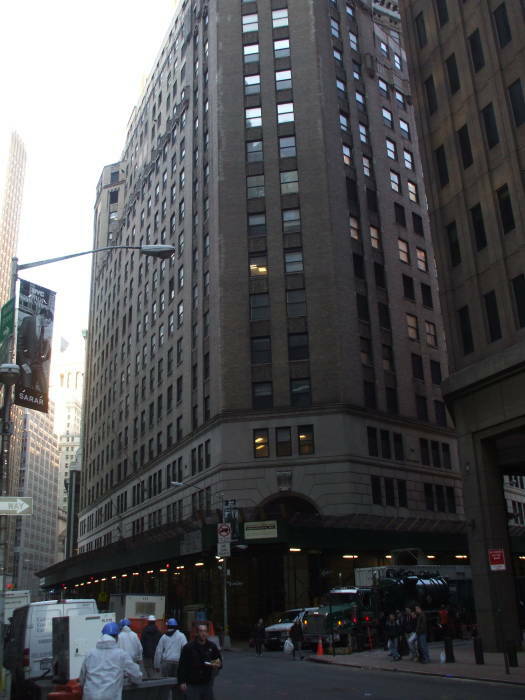 ITT left this facility and moved their headquarters uptown to 320 Park Avenue in 1961. 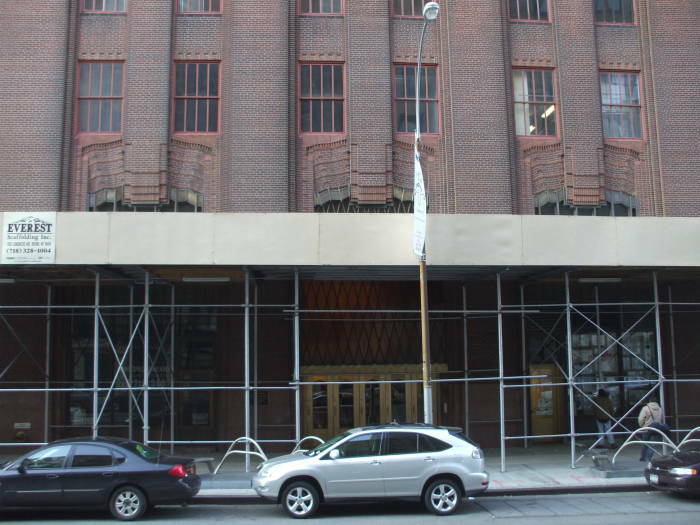 That elaborate entryway is at the southwestern corner of the building, seen in the picture below. The NYSE is up the street to the left. The very close location makes this data center more attractive for firms engaging in ultra high speed transactions along Wall Street. Peer 1 Hosting has a data center here, which Squarespace and Fog Creek Software, among others, use. Internap also has a data center here. Internap advertises having 2 MW of generator-backed electrical power in their data center here. But see below for the difficulties you can have fueling your generators. MetCom Network Services, XO Communications, and FiberMedia Group have a presence here as well. The Cunard Line, originally the Cunard White-Star Line, is a British-American shipping company that operated prominent trans-Atlantic ships including the Lusitania, Queen Mary, and Queen Elizabeth. Cunard was losing significant amounts of money in the early 1990s, and it was acquired by the cruise line operator Carnival Corporation in 1998. They continue to operate three Cunard ships, the Queen Mary 2, Queen Victoria and the new (launched 2010) Queen Elizabeth. 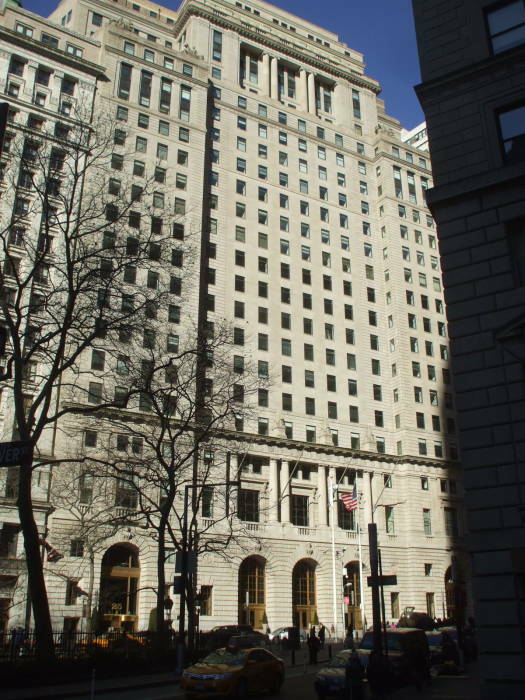 The Cunard Building at 25 Broadway was built as the company's U.S. headquarters in 1919. The many piers surrounding lower Manhattan, most of them torn down in the years since, were part of the busiest port in the world. 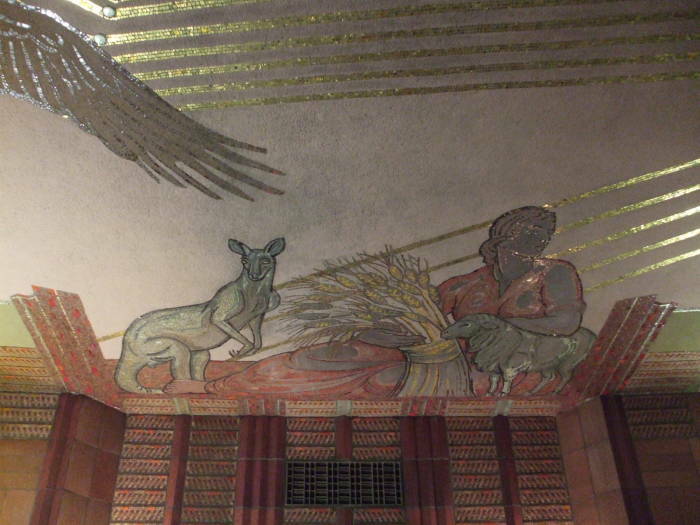 The great hall where the Cunard tickets were once sold is still decorated with paintings and murals showing the Cunard routes and sea creatures. 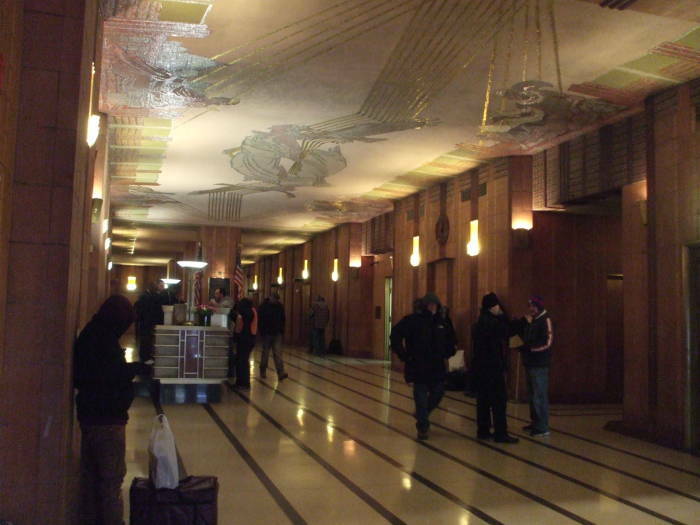 The great hall was converted to a U.S. Post Office in 1977. Telehouse America now has a colocation data center here. It covers 85,000 square feet on two floors, the 5th and 6th. 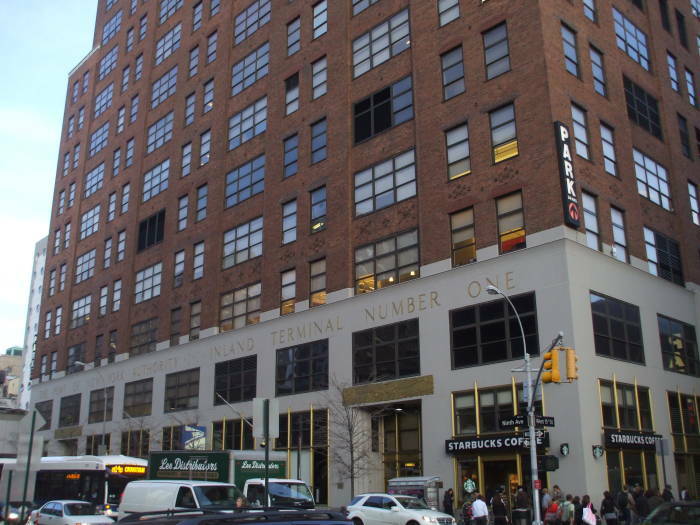 Telehouse runs the New York International Internet Exchange, NYIIX. 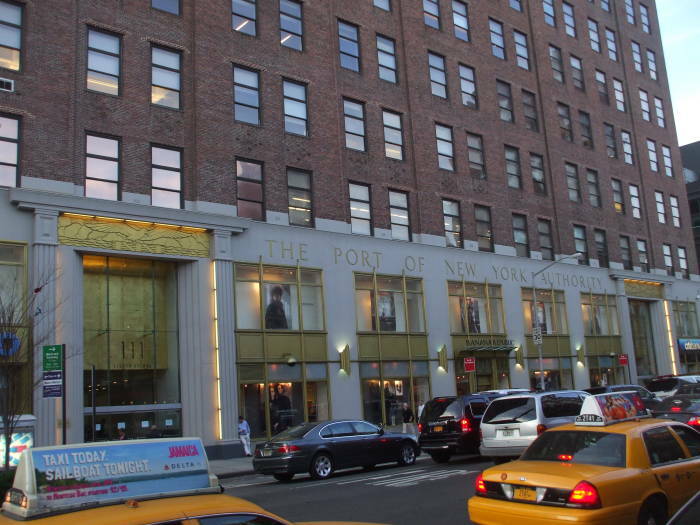 It has a 10GigE fabric supporting both IPv4 and IPv6 accessible from here, as well as 60 Hudson Street, 32 Avenue of the Americas, and 111 8th Avenue. 65 Broadway is the American Express Building. It is also used by zColo and Switch and Data New York. It has 15,000 square feet of colocation space and provides multiple connectivity options. 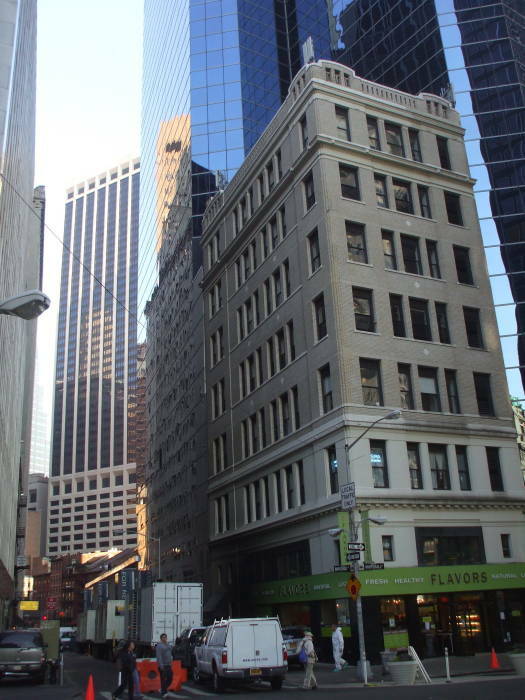 The 21-story building with its unusual arched cut-out was built in 1914-1917. It was the headquarters of American Express until 1975. 33 Whitehall houses Datagram, which hosts some high-traffic sites including Gawker, Gizmodo, the Huffington Post, BuzzFeed and Mediate, plus data centers operated by Telehouse, NYCVPS, Enotch Networks, and Cogent Communications, among others. 33 Whitehall is the 30-story polygonal glass tower. It was built in 1986. 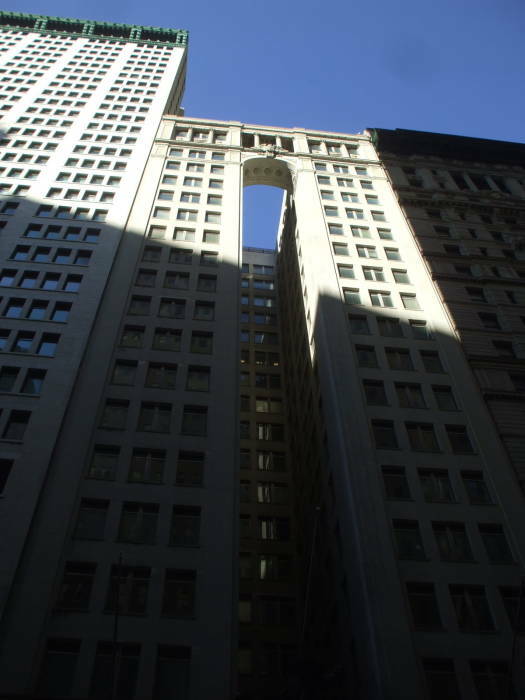 40 Wall Street was built in 1929-30 as a 927-foot, 70-story skyscraper. It was the world's tallest building for a few months, until a spire was added to the Chrysler Building. Then eleven months later, the Empire State Building was completed and stood taller than both. 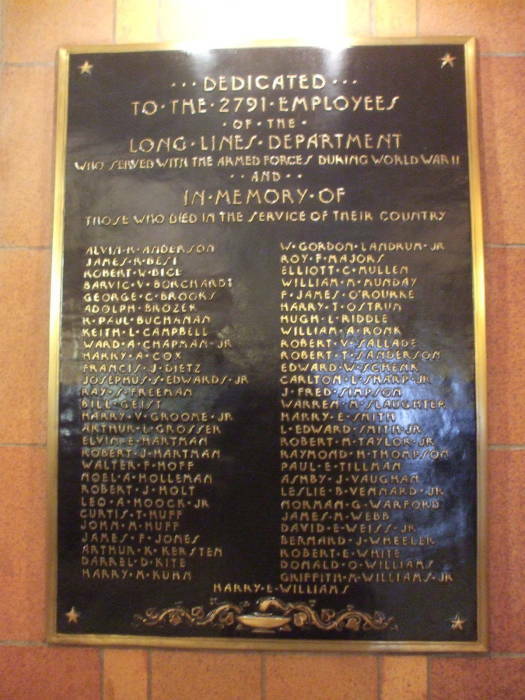 On the evening of May 20, 1946, a U.S. Army Air Forces C-45 Beechcraft crashed into the 58th floor on the north side of the building, creating a 20-by-10-foot hole and killing both crewmen and the three passengers on board. LaGuardia Field was reporting heavy fog and a ceiling of just 500 feet, obscuring approximately the top half of the building. The plane was flying from Lake Charles Army Air Field in Louisiana to Newark Airport. 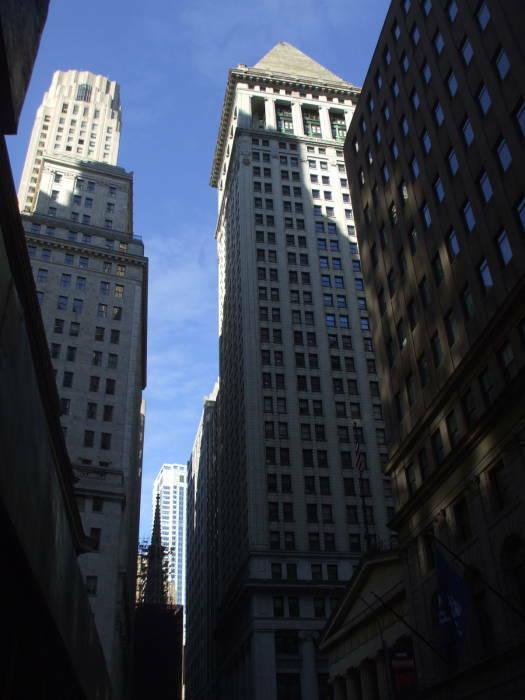 40 Wall Street now houses XO Communications and ControlCircle Ltd.
14 Wall Street, with the stepped pyramid at the top, is at the corner of Wall and Broad directly across from the New York Stock Exchange. TW Telecom is among the tenants. The architectural design concept is the Mausoleum of Halicarnassus placed on top of Saint Mark's Campanile in Venice, a "temple in the sky" based on one of the Seven Wonders of the Ancient World. Its construction in 1910-1920 started with the demolition of the 20-story Gillender Building, making this what some claimed to be the first case of one skyscraper being demolished to make way for another, taller one. At its completion it was the tallest bank building in the world, with 37 floors and standing 539 feet tall. 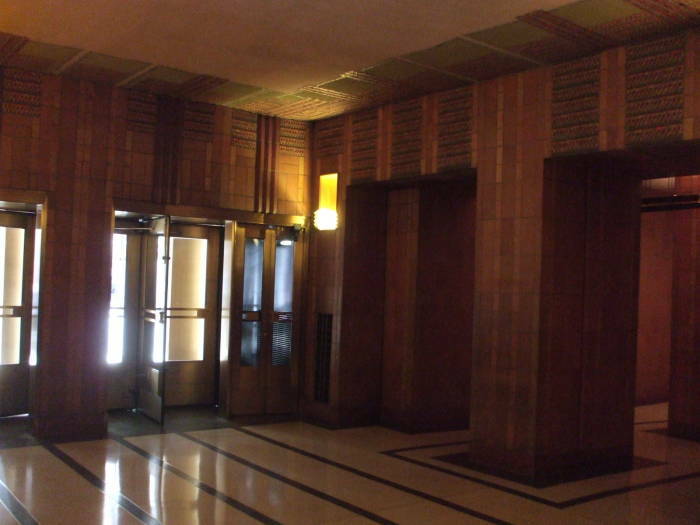 The 31st floor was once J. P. Morgan's apartment. 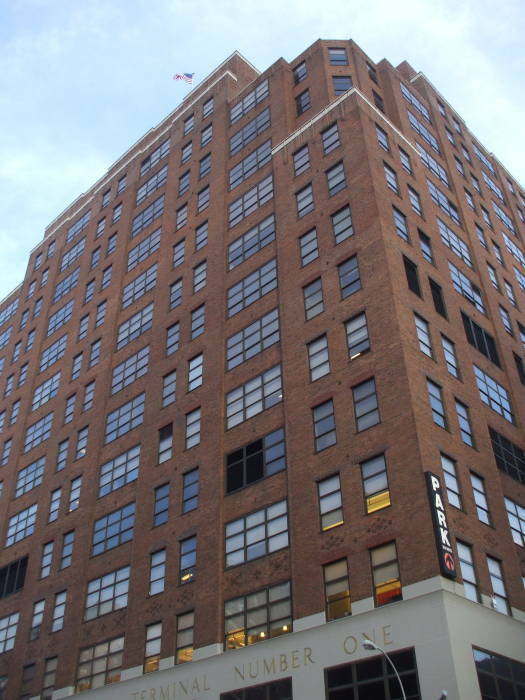 FDM Group, an international IT services provider, now uses the Morgan apartment. 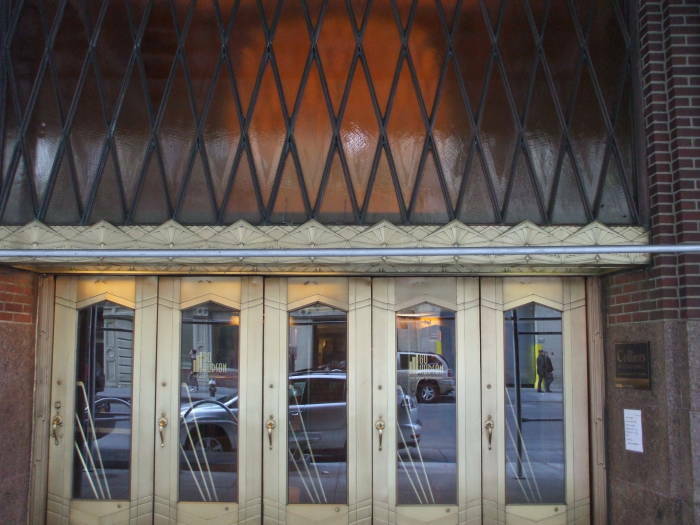 They kept many of its original features, including its bar, fireplace and wooden floors. 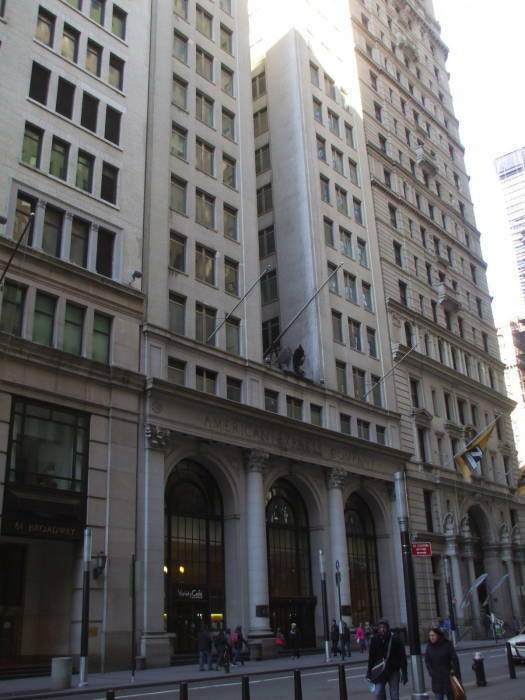 80 Pine Street houses a Global Crossing data center. 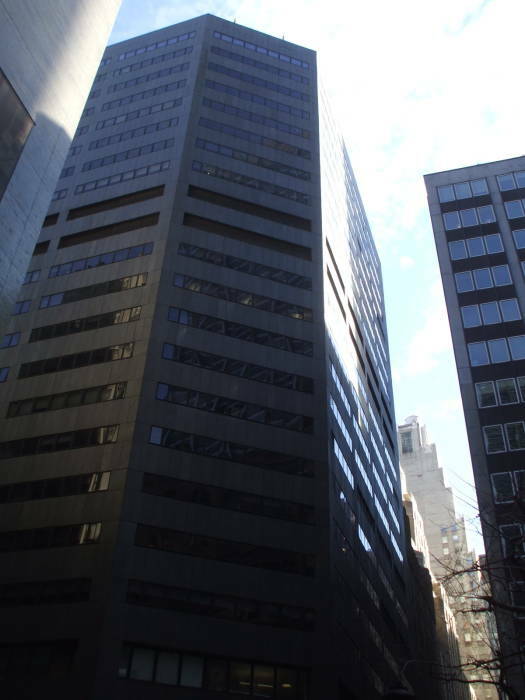 100 Williams Street houses a New York Internet data center that is both their headquarters and their largest data center. It covers over 30,000 square feet and meets SSAE16, HIPAA and PCI compliance requirements. There is over 2 megawatts of electrical power available. Their N+1 UPS provides 15 minutes of full capacity battery run time, and generator backup provides at least 72 hours beyond that. They have fueling contracts with multiple vendors to ensure that they can keep the generators running. Moving uptown past Canal Street along Varick Street, we come to 121 Varick Street. This fairly nondescript building houses a number of data centers. 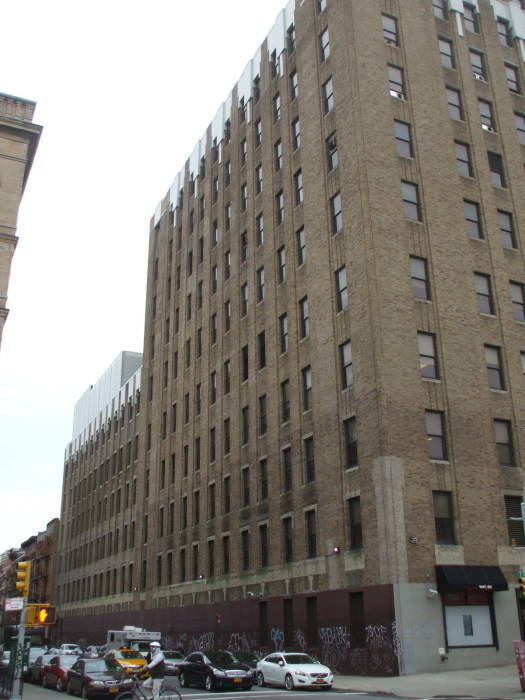 Tenants include: Atlantic Metro, Steadfast Network and Data Center NYC. Atlantic Metro has 15,000 square feet of space with another 10,500 available for expansion. UPS capacity is N+1 300 KVA, battery capacity is 15 minutes at full load. 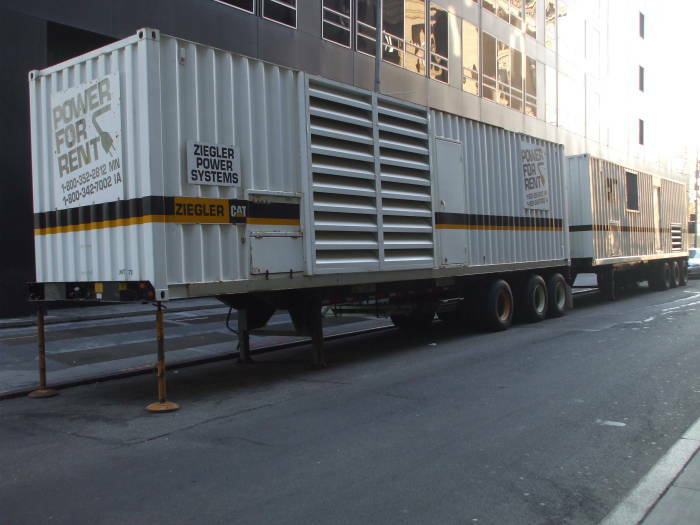 Generators are two 1.5 MW units with 7 days worth of diesel fuel. Atlantic Metro has a data center here. They were knocked offline when Hurricane Sandy hit in 2012, as utility power was shut down and the building's generator room was flooded. More on Hurricane Sandy and its impact on New York networking can be found below. 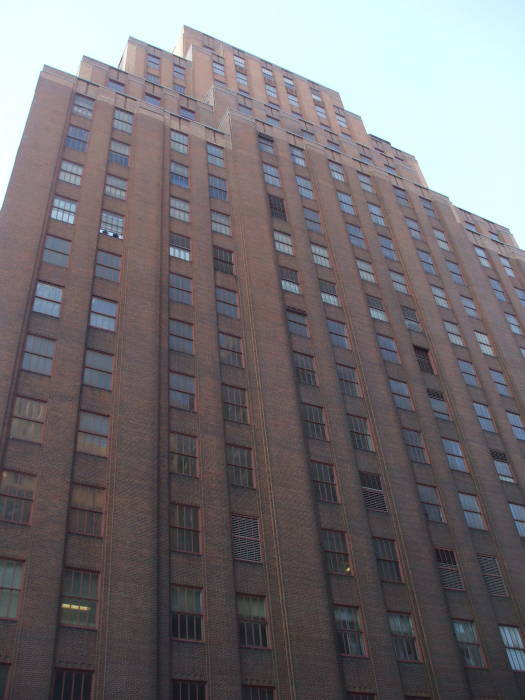 111 Eighth Avenue was completed in 1932 as the Union Inland Freight Terminal #1, later known as the Commerce Building of the Port Authority of New York and New Jersey. 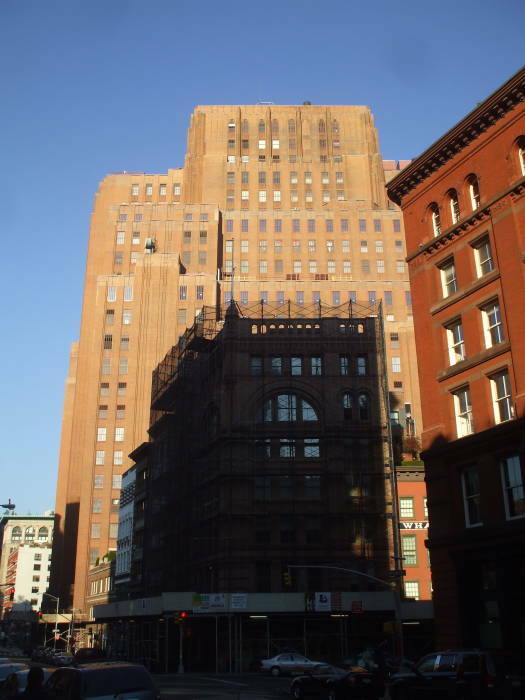 It is an enormous building, filling the entire block between Eighth and Ninth Avenues and 15th and 16th Streets, with almost three million square feet of floor space spread across fifteen four-acre floors with ceilings over fourteen feet high and windows ten feet tall. See the cross-hatched block on the map. The elevators can lift entire trucks to upper floors, the trucks up to 32 feet long and weighing up to 20 tons. New York Governor Franklin D Roosevelt, soon to be elected U.S. President, broke ground for the project in 1931. He announced that the facility would serve as "a post office for freight." At that time, a trucker hauling a collection of small freight shipments would likely have to stop at as many piers as there were categories of goods in his shipment. With the new facility, goods were taken from the piers to a series of loading bays along the 15th Street side. The goods would be sorted inside, then loaded into trucks pulled into bays on the 16th Street side. Each truck would be loaded in a single trip. Once the trucks pulled out, both the Lincoln and Holland Tunnels under the Hudson were nearby. 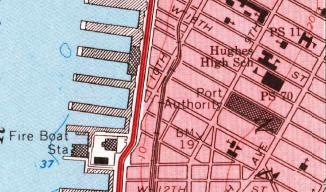 The Port Authority moved out in 1973, moving their headquarters to the World Trade Center complex. 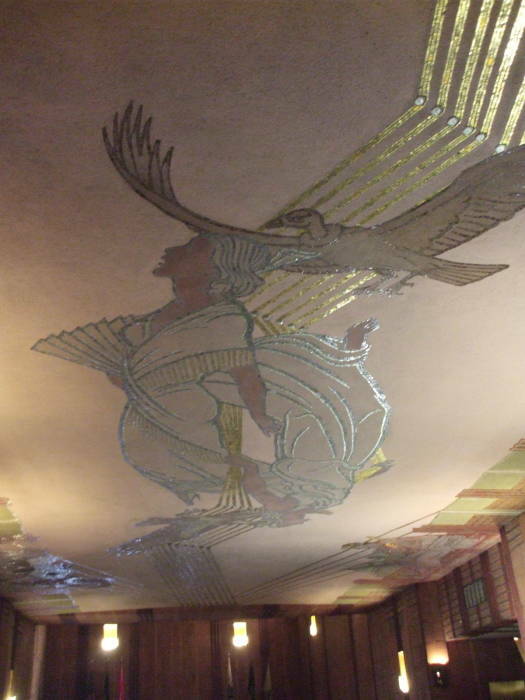 The building was renovated as a carrier hotel by Taconic in the late 1990s. A major trunk of optic fibers from multiple carriers runs almost directly under the building, making this one of the most important telecom carrier hotels on the East Coast. Google was leasing space in the building. In 2010, they contracted to purchase the entire building for what was reported to be around $1.9 billion. The building now houses more than 30 global carriers. Internap advertises having 6 MW of generator-backed electrical power in their data center here. 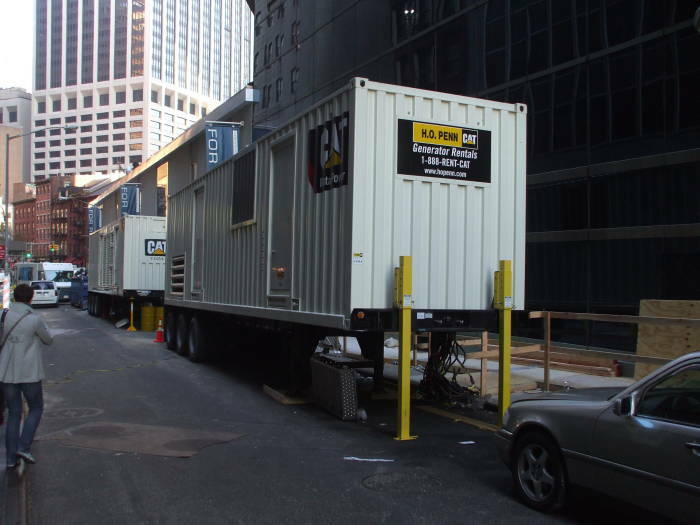 Telx advertises 24 MW of generator power backing 17 separate 4000-ampere 460-volt Con Edison feeds, building-wide. Yes, that is just over 31 megawatts. XO, Verizon, Sprint, Level 3, TelX and many other carriers operate here. The ground floor houses a number of non-network businesses. A cancer center developed by St Vincent's Hospital has 70,000 feet in a facility in the middle of the 15th Street side. That's down to the left in this picture. 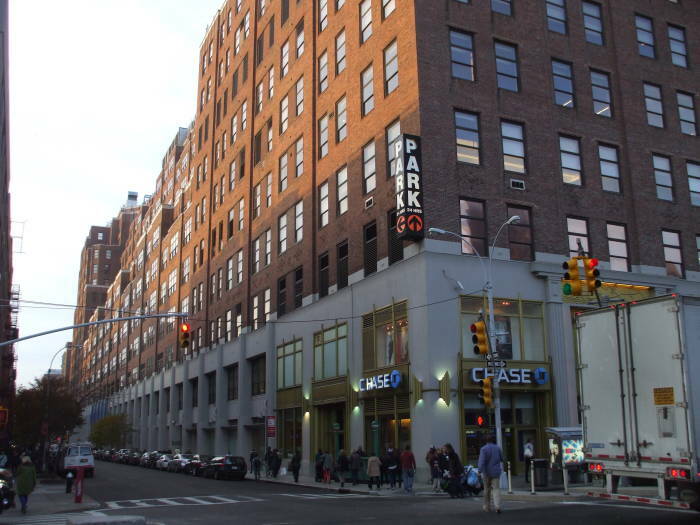 A Chase Bank branch is on the corner of 15th and 8th Avenue. Banana Republic is a large commercial presence in the center of the 8th Avenue side, and there's a Citibank branch at 8th Avenue and 16th Street. Some large ventilation louvers are on the 15th Street side, where shipments used to arrive from the piers. 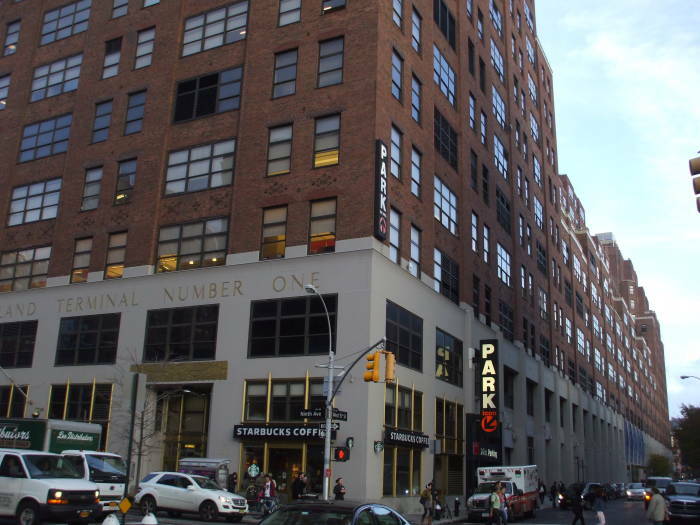 A Starbucks (of course) and a U.S. Post Office are on the Ninth Avenue side. 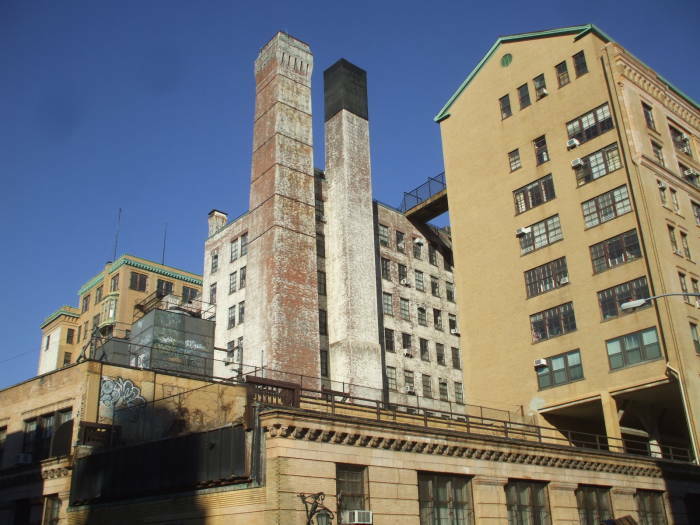 It's hard to gauge the size of the building, but it does loom over its surroundings in the Chelsea district. 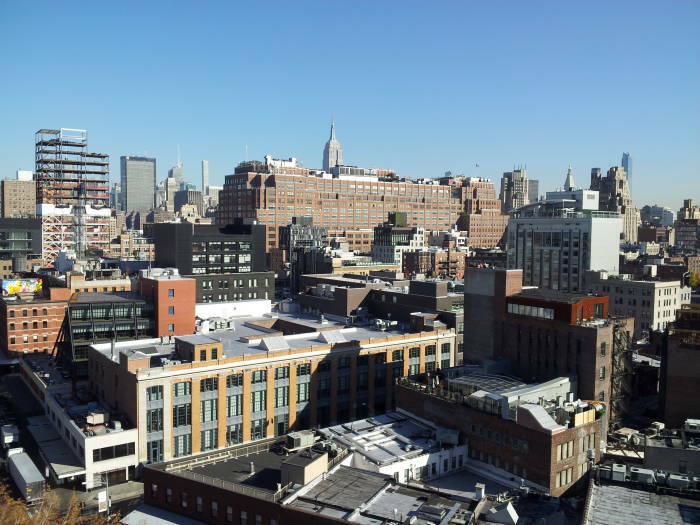 Below is a view of 111 Eighth Avenue from the balcony of the Whitney Museum in the Meatpacking District. 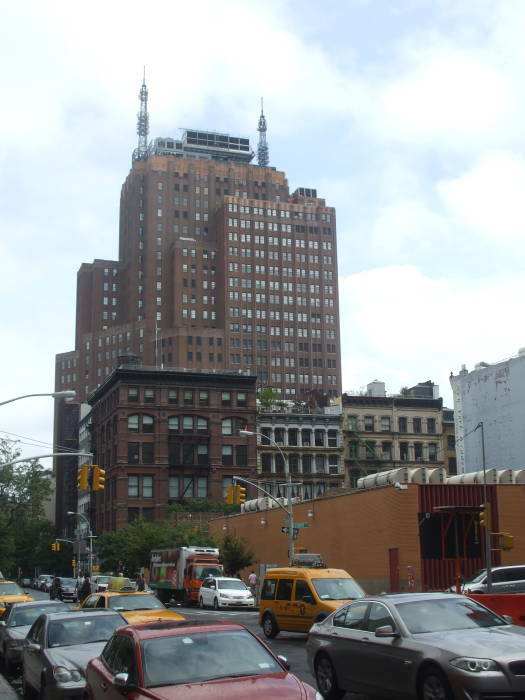 The AT&T Switching Center is at 811 Tenth Avenue, the block along the west side of the avenue between 53rd and 54th Street. 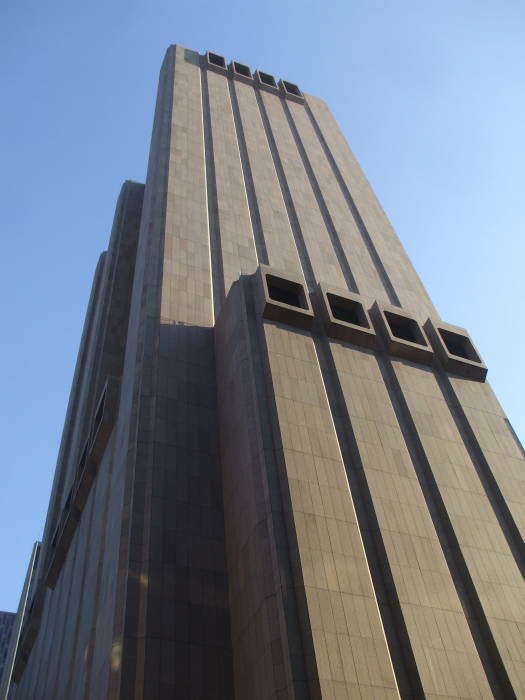 It's a windowless building 370 feet tall, with the antennas topping out at 440 feet. 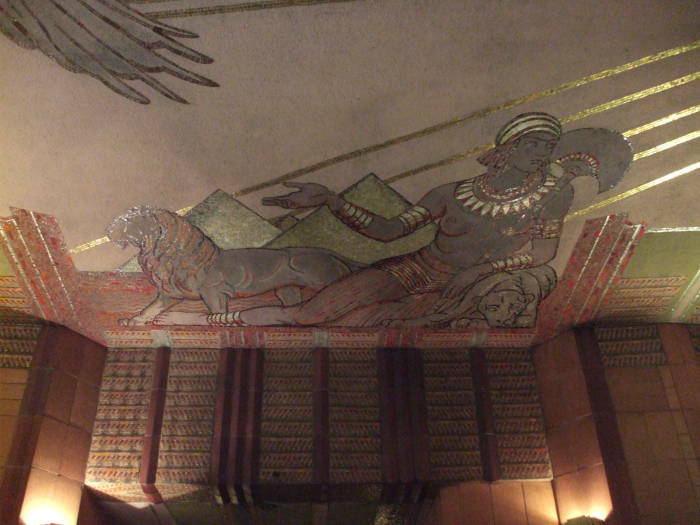 It is divided into 21 extra-high floors, the equivalent of 40 normal stories. It is the largest AT&T switching center in New York. This is another example of the Brutalist style of architecture, completed in 1964. 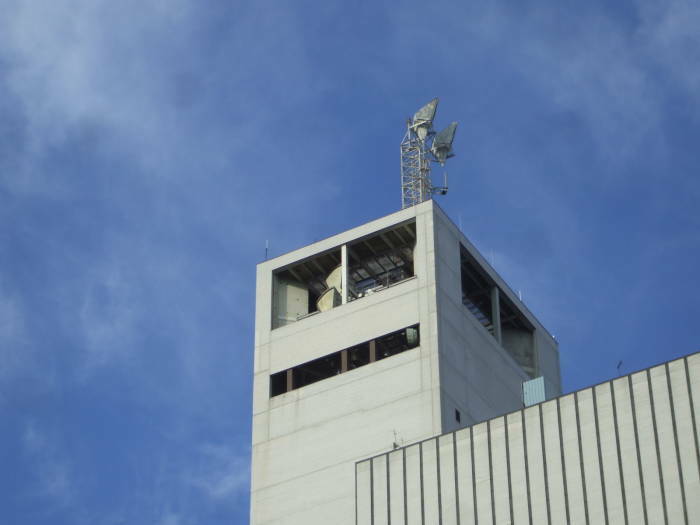 Some of the microwave antennas may still be in use, but at least one of the two large horns at the very top is no longer connected to its feedline. 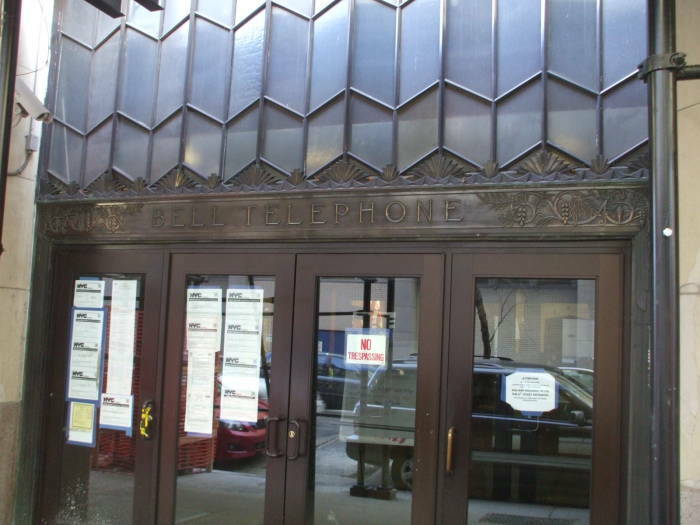 435 West 50th Street between 9th and 10th Avenues was an old Bell Telephone facility, as we see from its vintage entryway below. 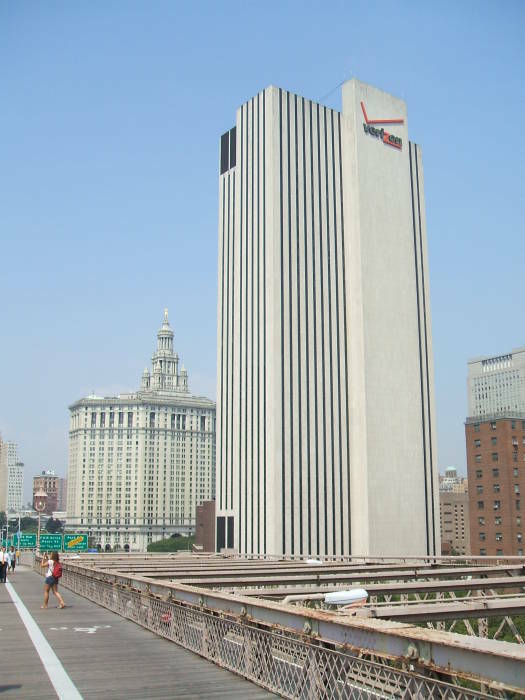 Verizon sold part of the building for $20.025 million in 2011, around 101,000 square feet out of the total of 299,534, including the 10th through 17th floors and portions of the penthouse, ground floor and lower level. The basement houses telecommunications switching equipment, and Verizon had offices in the upper floors. The new owners were planning to convert the upper floors to 65 to 70 condominiums, with the 1930s facade little altered beyond new windows. 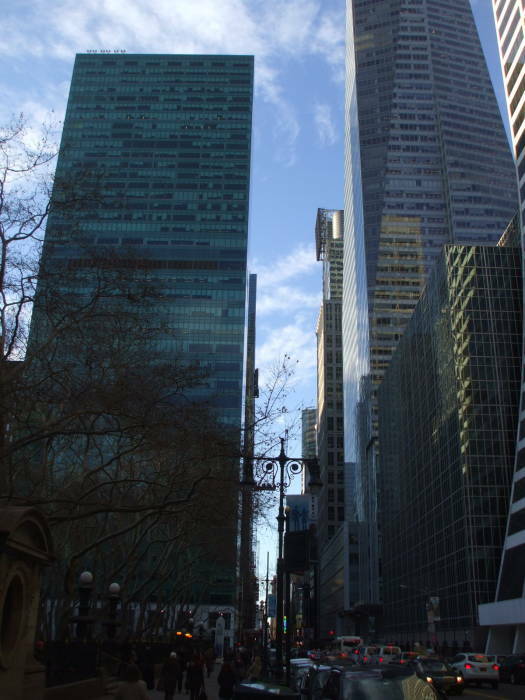 1095 Avenue of the Americas (Sixth Avenue at 42nd Street) is the blue-green glass building to the left as we look west on 42nd Street along the north edge of Bryant Park behind the main New York Public Library building. 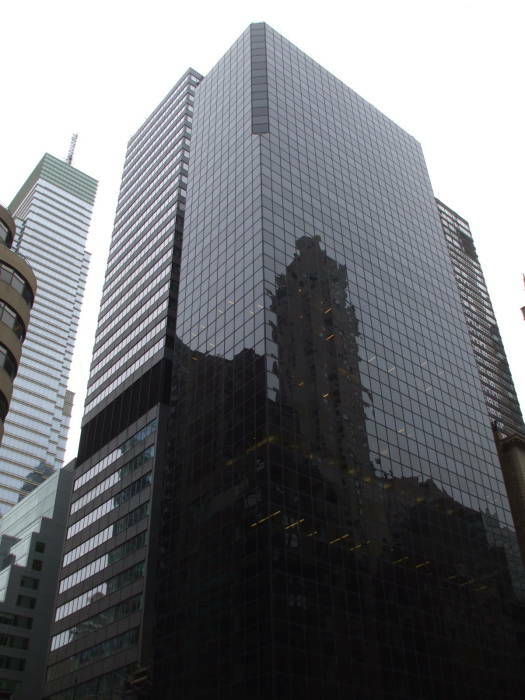 It was built in 1972-1974 as the headquarters of New York Telephone, and also served as the headquarters of Bell Atlantic. 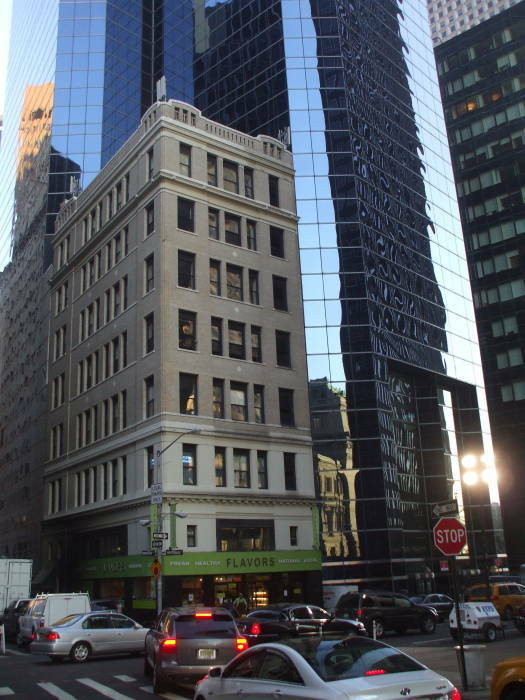 The headquarters moved out but kept some offices in the building, and floors six through twelve are the switching office for landlines in midtown Manhattan. 204 2nd Avenue at 13th Street is a large switching center. 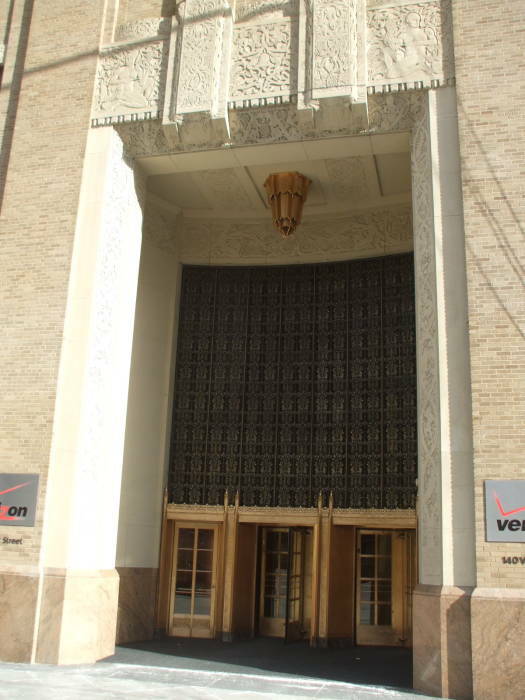 It now has a Verizon FiOS shop on the ground floor, an unusual case of public sales in a telecommunications facility. A fire broke out in the building on the morning of February 27, 1975. 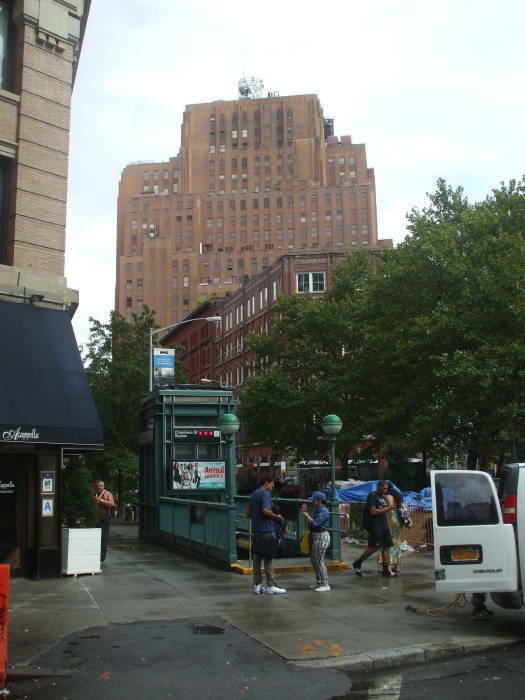 The building houses the Main Distribution Frame serving lower Manhattan and Brooklyn. The mainframe was destroyed and switching equipment was melted or damaged by smoke. This took out approximately 170,000 telephone lines. The Bell System brought mobile phone trucks to lower Manhattan to provide at leas some service. Full service was restored in about two weeks. This was the largest loss of telephone service due to fire in the U.S. until September 11, 2001, when 300,000 circuits were disrupted and 10 cellphone towers destroyed. 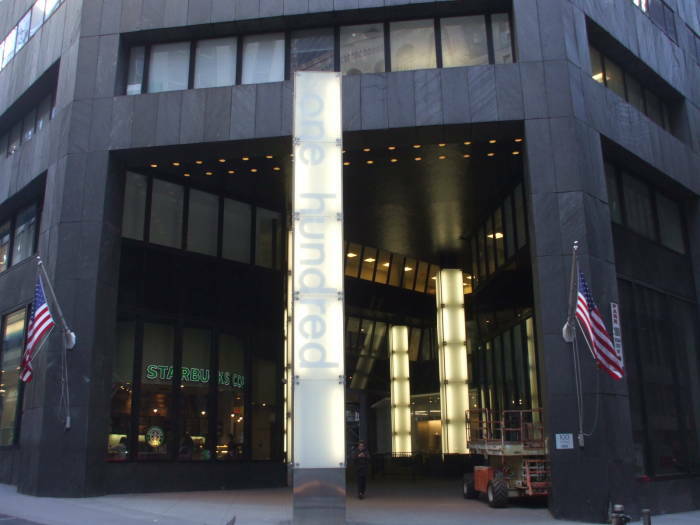 110 East 59th Street hosts a Global Crossing data center. 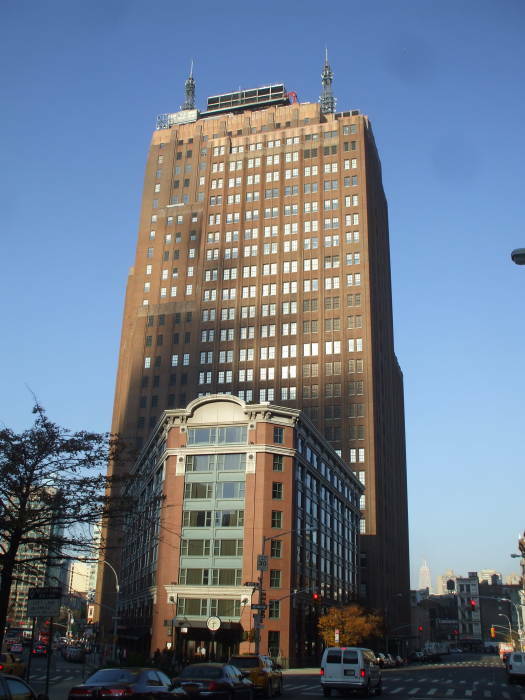 140 West Street, also known as the Verizon Building, is a switching center and the headquarters of Verizon Business. It's the second building on the far side of this street. 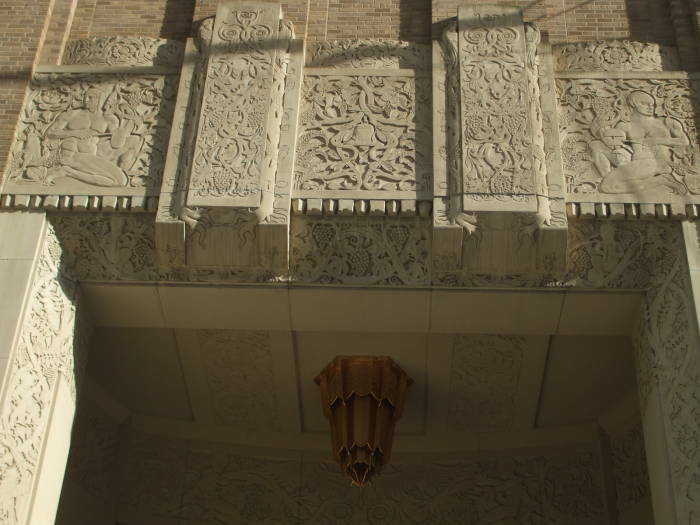 Its designer was inspired by Mayan architecture and incorporated Mayan features in the facade and its decoration. 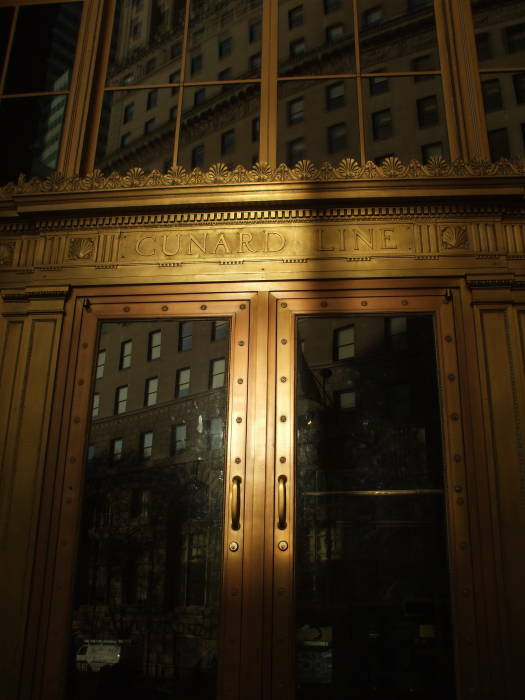 It served as the headquarters of the New York Telephone Company. 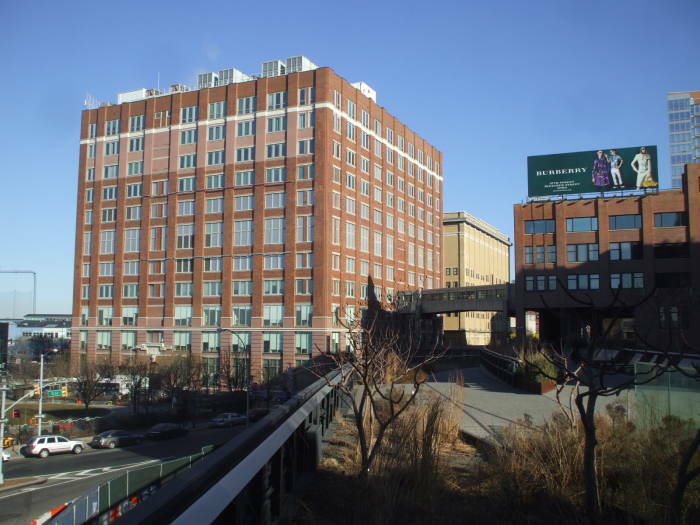 When NYNEX was formed in the breakup of AT&T, it became the NYNEX headquarters. Then NYNEX merged with Bell Atlantic, and it was the Bell Atlantic headquarters. And then, when Bell Atlantic and GTE merged to form Verizon, it became Verizon's headquarters. Its five sub-basement levels house telecommunications equipment. It was partially flooded by the storm surge of Hurricane Sandy in late 2012. 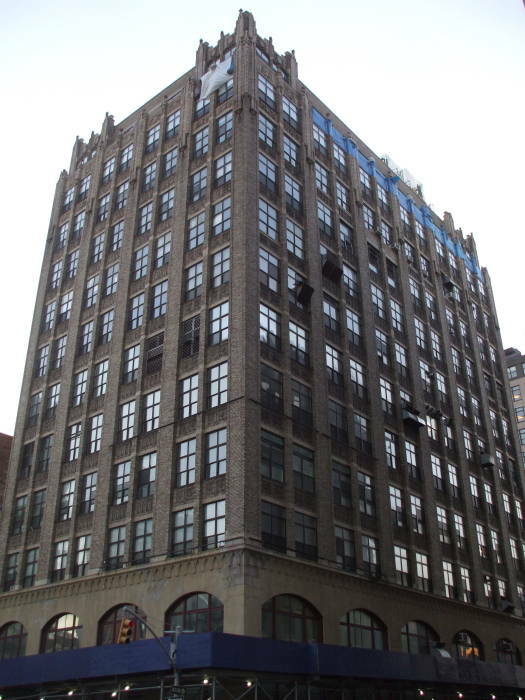 601 West 26th Street is another enormous building near the former sites of piers. 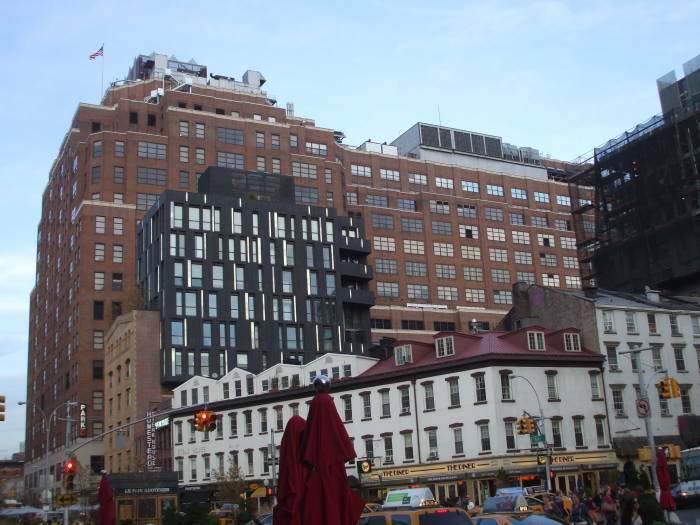 It fills the block between Eleventh and Twelfth Avenues, and 26th and 27th Streets in Chelsea. 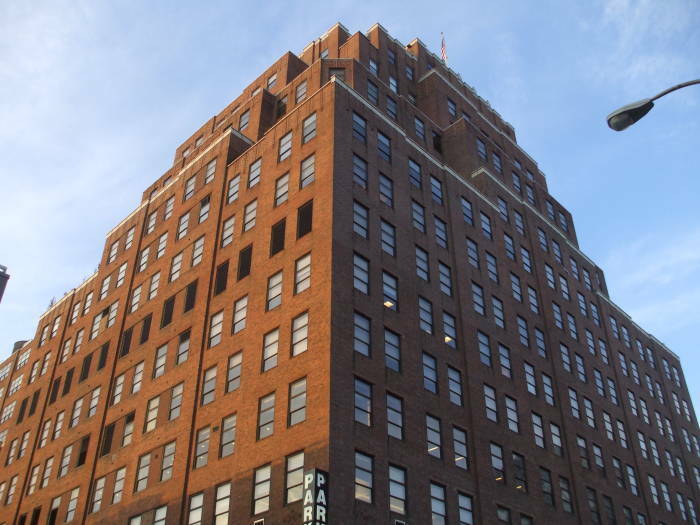 This is the Starrett-Lehigh Building, built in 1930-1931 as a joint venture of a real-estate firm and the Lehigh Valley Railroad. Trains could be driven directly into the ground floor, which housed a rail yard, loading and unloading facilities for trucks, warehouse area, and areas to display goods. 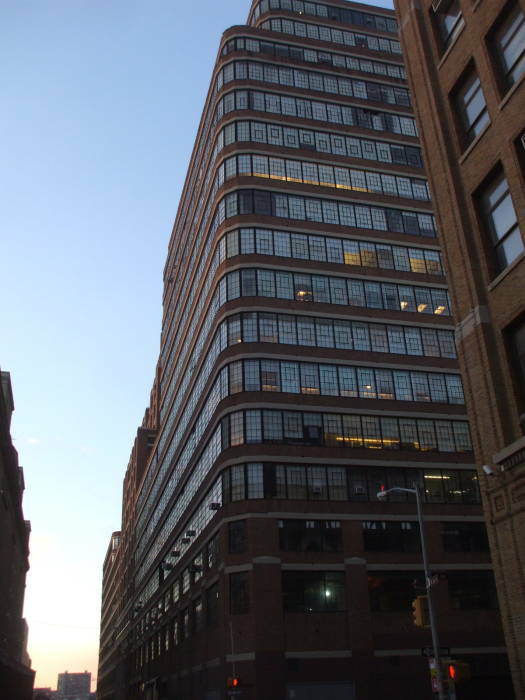 It was in competition with another enormous building that is now an Internet hub, the Google-owned 811 Tenth Avenue. The railroad sold this building and the rail lines were removed in 1966. Lexent Metro Connect, Level 3, SBC SuperPoP, and Broadview operate data centers on the 4th and 6th floors. A number of non-telecommunications companies operate in the building, the largest is Tommy Hilfiger USA. Martha Stewart Omnimedia and Ralph Lauren's Club Monaco US are also prominent tenants. 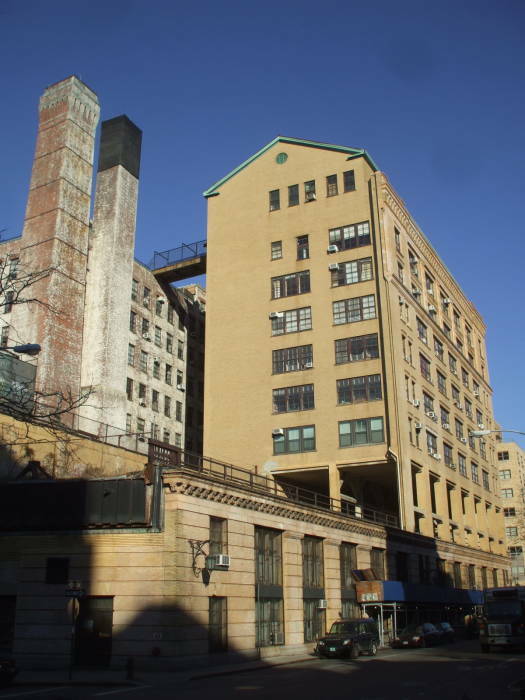 51-55 Bethune Street was the headquarters of Bell Telephone Laboratories before that moved to New Jersey. Bell Labs used this from 1868 through 1966. Chain broadcasting, the vacuum tube, and the transatlantic telephone system were invented here. 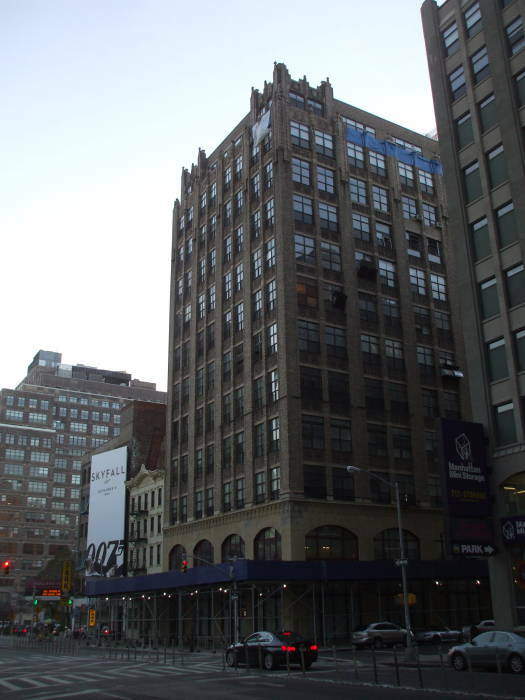 Parts of The Jazz Singer, the first sound movie, were produced here. 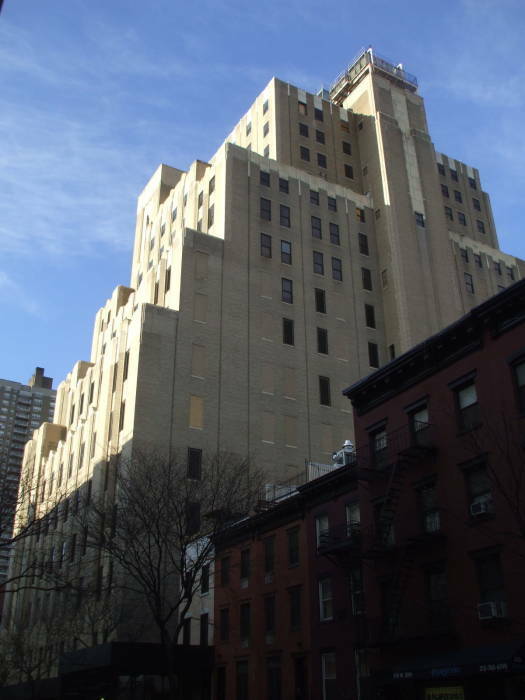 In 1966-1970 it was converted into Westbeth, a complex for artists including subsidized housing and studio and theatre space. 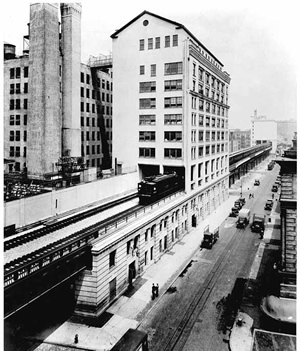 The High Line, a system of elevated rail lines, ran through the building on the third floor level. The High Line, a system of elevated rail lines, ran through the building on the third floor level. The black and white picture is from 1936. 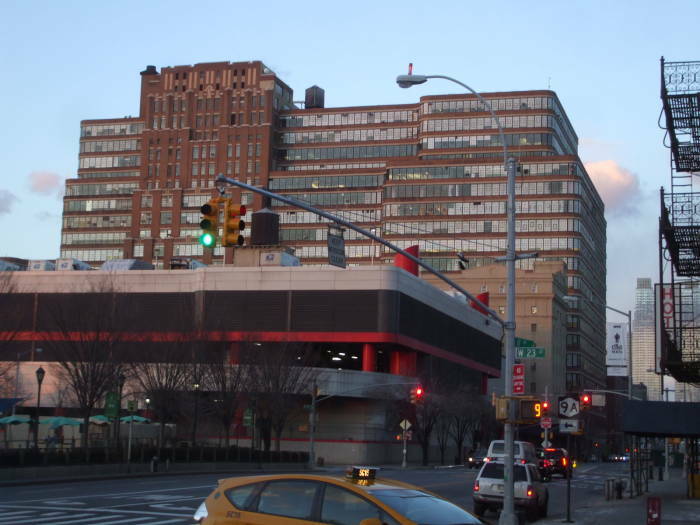 85 Tenth Avenue was another industrial building connected to the High Line. Here we are looking north on the new High Line Park, 85th Tenth Avenue is on the left. 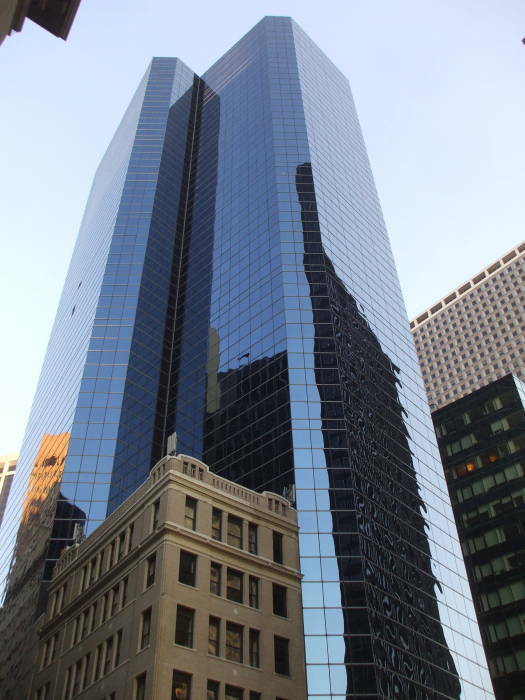 Now its 11 floors host several data centers, for zColo, both L-3 Communications and Level 3, Lexent Metro Connect, and Telehouse. The High Line Park is built on the elevated rail bed. Here you see where a line branched off and entered that building. 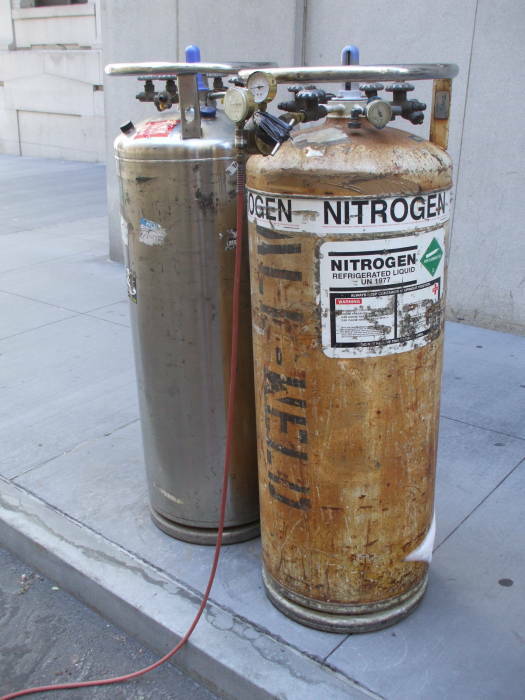 Liquid nitrogen, commonly referred to simply as LN2, is a compact and easily transported source of very dry nitrogen. Handled carefully, it is a safer source than pressurized gas. 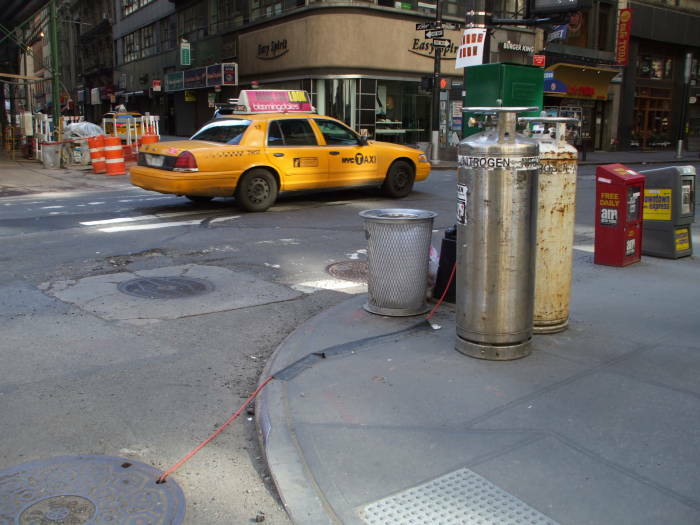 Containers of liquid nitrogen can solve problems associated with running telecommunication cables in moist environments. In other words, LN2 can keep your wires (and fibers, and fiber repeaters) dry. New York's Financial District is at the very southern tip of the island of Manhattan, in the narrow twisting streets of old Nieuw-Amsterdam. There are huge numbers of telecommunications lines running through a small area just a few meters above the water line, where the East River and the Hudson River join in New York Harbor. So, in New York it is pretty common to see containers of liquid nitrogen sitting along the street. They're often chained to a streetlight pole. A small red rubber hose is duct-taped to the ground and disappears into a manhole cover. These two vacuum flasks of liquid nitrogen are on the sidewalk along Broadway where it crosses John Street. 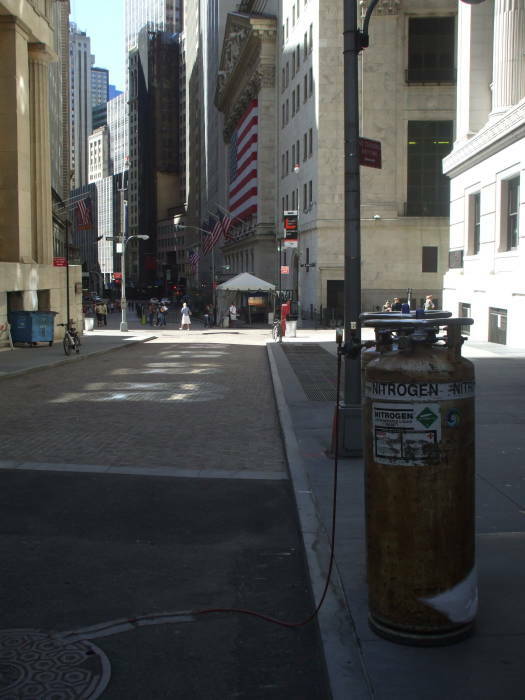 These two containers of liquid nitrogen are along Nassau Street, leading toward the New York Stock Exchange where the street's name changes to Broad Street. 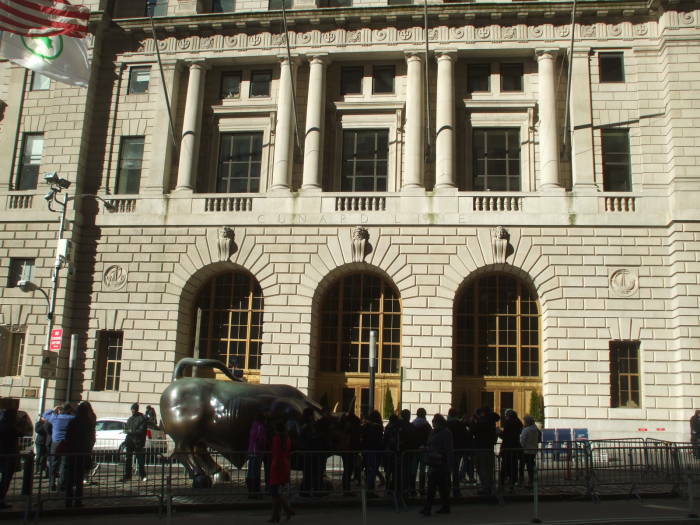 The NYSE is on the corner of Broad and Wall Streets, fronting on Broad. That's its columned front with the large American flag in the background. There is a guard post just across the street, so these Dewars have 24/7 protection and aren't chained to anything. Liquid nitrogen is a clear liquid that looks much like water and is slightly less dense — 0.807 g/mL or just 80.7% the density of water. It is, however, extremely cold. It boils at 77 K (–195° C or –321° F). You can see the frost built up on the top plumbing in the close up view of these containers along Broadway. A Dewar flask, named for the Scottish physicist and chemist James Dewar who invented it in 1892, is a large vacuum flask used to store liquid nitrogen for periods of days to a few weeks. A big flask for scientific and industrial applications is often called a Dewar, while a small one for your coffee is often called a Thermos. Generally speaking they're all vacuum flasks. A vacuum between the inner and outer walls minimizes heat transfer. A small fraction of the liquid nitrogen boils off, holding the body of the liquid at 77 K. Nitrogen expands by a factor of 1:694 going from the liquid to the gaseous phase, so the dewer must be unstoppered or, more likely, stoppered with a pressure relief value. 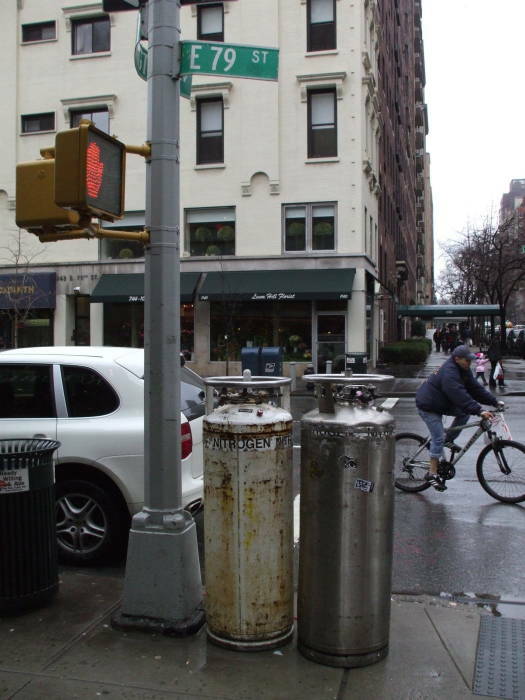 Most of the liquid nitrogen containers you see in Manhattan are down in the Financial District, but some make it to Midtown or even further north. 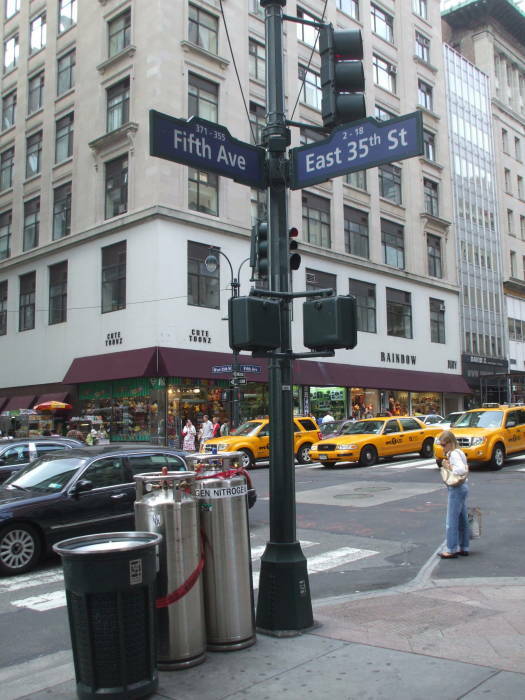 Here are two at Fifth Avenue and East 35th Street, a block north of the Empire State Building. I've seen them as far north in Manhattan as Lexington Avenue and East 79th Street on the Upper East Side. Hurricane Sandy was the largest Atlantic hurricane on record as measured by diameter. It killed at least 253 people in seven countries along its path, and caused losses estimated to be about $66 billion in damages and business interruption. Hurricane Sandy developed out of a tropical storm in the western Caribbean Sea on October 22, 2012, and was classified as a hurricane on the 24th. An emergency was declared in New York on October 28th as the hurricane approached, and the MTA and other mass transportation was shut down. MTA subway, bus and commuter rail was suspended starting at 7 PM on the 28th. The PATH rail service stopped at midnight on the 28th. All bus carriers at the Port Authority Bus Terminal closed at 3 AM on the 29th. The hurricane moved ashore in New Jersey early on Monday, October 29. The New York Stock Exchange was closed for the 29th and the 30th, the first two-day weather shut-down since the Great Blizzard of 1888. The hurricane happened to move ashore during a full moon period. The storm surge, the elevation in sea water level due to the extremely low pressure accompanying the hurricane, coincided with the maximally high tides. This caused the storm surge to be about 14 feet above the average low water level. Many roadway and subway tunnels were flooded. The water level was well above ground level at subway stations like South Ferry and Whitehall, meaning that the water could simply pour down the staircases and flood the station and tunnels. 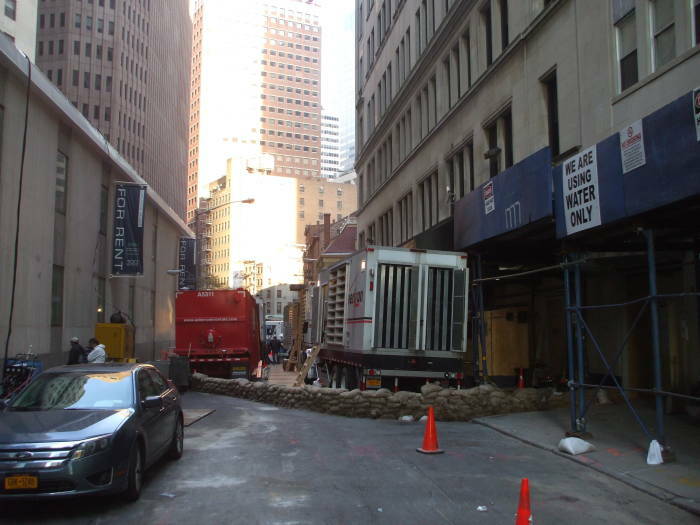 Electrical power was lost in Lower Manhattan at about 4:30 PM on Monday, October 29, as subterranean vaults holding transformers and distribution systems began taking on water. Basements of buildings started flooding. By 8:30 PM Monday night, lobbies began taking on water in buildings nearer the waterline. The problem in a number of cases was that while the building did have generators on a mezzanine or higher level and well above the water line, their diesel fuel was stored in tanks below ground level. The electrical pumps normally used to provide fuel for the generators were submerged. While there was fuel for the generators, it couldn't be electrically pumped to them. 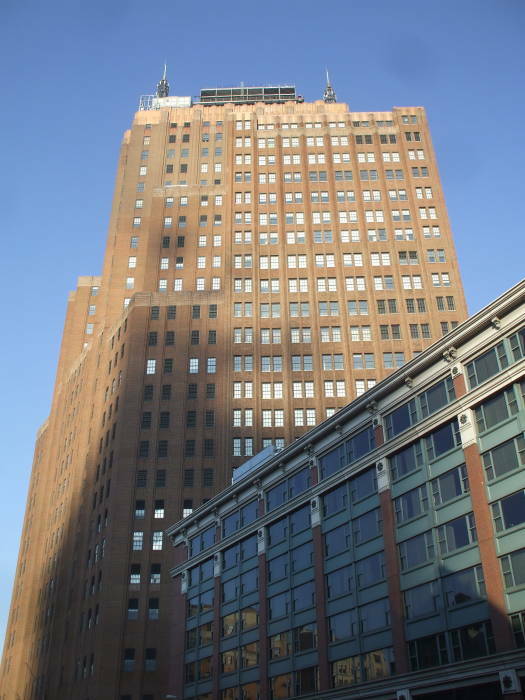 For example, the diesel generators at 75 Broad Street are on the 17th floor. The fuel tanks are in the basement, and they and their electrical pumps were submerged. So, employees of operators using the Peer 1 data center resorted to a bucket brigade, carrying 5-gallon buckets of diesel fuel up 17 flights of stairs. 33 Whitehall and 121 Varick lost power when their basements flooded. Other sites, like CoreSite / 32 Avenue of the Americas, 60 Hudson Street, and 25 Broadway stayed on line through the hurricane. Con Ed was not able to begin restoring power due to flooded infrastructure until Friday night, November 2nd, and at mid-day on Saturday, the 3rd, there were still areas without electrical power. The pictures below are from over a week later, on the afternoon of November 11th. In these pictures we're looking north on Bridge Street from Whitehall, 33 Whitehall is the glass tower in the background above. A number of portable generators were brought in, as well as fuel for building generators that couldn't be fueled otherwise. 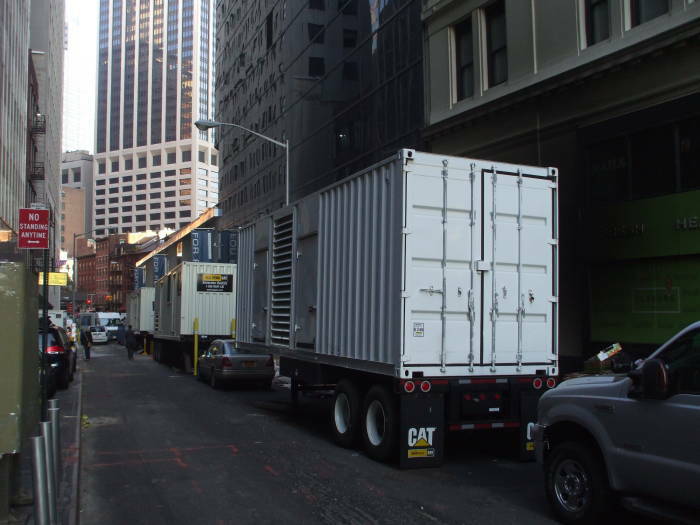 The first problem was getting large portable generator sets to the New York area. Then, they had to be brought to Lower Manhattan. All of the road tunnels except the Lincoln Tunnel had been closed, and many of the bridges were closed as well. There was the issue of getting adequate fuel for the generators, and even for the trucks hauling the generators and their fuel. Many of the streets in Lower Manhattan were closed, and traffic signals were inoperable even on ones that were open. 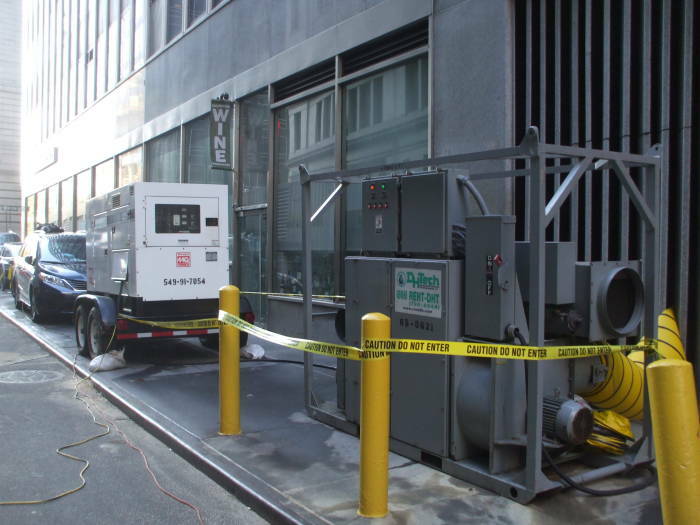 A building-fed fuel system malfunctioned at 111 Eighth Avenue, cutting fuel to rooftop generators. Parts of the building rolled back to UPS systems, which were quickly exhausted. That facility also had problems with cooling, forcing some systems to be shut down. Cool air, dry air, and fuel were all precious commodities. A week later, some sandbags were still in place. Portable tanks had been brought in to hold water still being pumped out of basement areas, so the water wouldn't be pumped out and immediately flow back in again.